2017-12-20 Application filed by Cima Labs Inc. filed Critical Cima Labs Inc.
Disclosed herein are dosage forms demonstrating resistance against attempted liberation of hydrocodone or a salt thereof from the dosage forms by one or both of manipulation, attempted isolation of the hydrocodone or salt by chemical extraction. Also disclosed are dosage forms demonstrating resistance to pharmacokinetic changes, pharmacodynamic changes, or both, in response to attempted liberation or attempted isolation of the hydrocodone or a salt from the dosage form. Also provided are dosage forms that yield hydrocodone or a salt having a reduced degree of purity in response to manipulation of the dosage form, and extraction of the hydrocodone or salt. The present disclosure also provides dosage form demonstrating resistance against attempted liberation of hydrocodone or salt thereof from the dosage form by ingestion with alcohol. Methods of treating chronic pain by administering to a subject any of these dosage forms are also disclosed. This application claims the benefit of priority to each of U.S. Provisional Application No. 62/436,725, filed December 20, 2016, U.S. Provisional Application No. 62/436,738, filed December 20, 2016, U.S. Provisional Application No. 62/436,744, filed December 20, 2016, and U.S. Provisional Application No. 62/436,752, filed December 20, 2016, the entire disclosures of each of which are incorporated herein by reference. The present disclosure pertains to dosage forms that contain opioid analgesics and methods of treating chronic pain using such dosage forms. Pain is the most common symptom accompanying, to some degree, almost every medical condition humans experience. When it is severe enough, it interferes with a patient's ability to function and with his/her quality of life. While numerous efforts are underway to find new safe and effective non-opioid analgesic drugs, currently extended release (ER) / long acting (LA) opioids are one of the key components of the armamentarium for the treatment of moderate to severe pain. Many patients in the United States suffer from refractory chronic pain as existing therapies often provide inadequate relief and poor tolerability. The risks of abuse and the potential sequelae of overdose and death associated with prescription opioids pose a serious and growing public health risk and constitute a serious unmet medical need. There has been a 542% increase in the non-medical use of prescription opioids since 1992 (Lourenco et al 2013). Abuse of prescription opioids lead to serious medical complications, including but not limited to addiction, physical dependence, overdose, withdrawal symptoms, drug-related suicide, drug-related car crashes, spreading of serious diseases via shared drug paraphernalia, and death. In 2008, prescription opioids were involved in more overdose deaths than heroin and cocaine combined (CDC Policy Impact 2011). As sales of prescription opioids in the US increased by over 300% from 1999 to 2008 (CDC Policy Impact 2011), overdose deaths involving these products increased proportionally over the same period to 19,000 in 2014 (Califf et al 2016). The FDA has strongly supported the development of abuse deterrent formulations (ADFs) and will continue to support ADFs and encourage development of more effective abuse-deterrent features as one of several ways to combat the abuse epidemic (Califf et al 2016). Further limiting access to potential treatments is not an acceptable option when new treatments are critically needed (FDA 2013). Drug abusers often seek the maximum plasma drug concentration (Cmax) in the shortest time (high Cmax/short tmax). Accordingly, ER opioids are often manipulated by drug abusers to transform conventional ER dosage forms to immediate-release (IR) forms for the purposes of abuse by the oral, intranasal, or intravenous (IV) routes of administration (ROA). In general, opioid abusers seek to break down the ER opioid into the smallest possible particle size to defeat the ER mechanism and achieve the most rapid release of the drug product. As a result, many abuse deterrent products rely on hardness as a physical barrier to resist particle size reduction and therefore deter abuse. However, abusers are becoming more sophisticated in their attempts to defeat formulations that rely on hardness for abuse-deterrence, with multiple manipulation-attempt recipes available on drug-user internet forums (McNaughton et al 2014). Common manipulations focusing on particle size reduction include breaking, splitting, crushing, milling, and grinding the tablet. Although less common, some abusers will use solvents to extract the active ingredient. While the most uncommon, the most successful techniques involve multi-step liquid extraction, which requires time, sophisticated chemistry knowledge, and expensive equipment. Balancing the benefits of prescription opioid analgesics against their abuse liability can be challenging for clinicians. Thus, the development of ADFs of prescription opioid analgesics is an important step toward reducing abuse and diversion of these medications, while ensuring access to these drugs for patients with legitimate medical need. While currently available data suggest that ER opioid formulations (e.g., OXYCONTIN®) have deterred abuse to some extent (Butler et al 2013, Havens et al 2014), abusers can still successfully defeat the ADF properties via manipulation and extraction in many cases (Cicero and Ellis 2015), leaving a significant continued need for new ADF products. hydroxypropylmethyl cellulose in an amount of about 5-12% by weight of the dosage form, and lactose in an amount of about 35-75% by weight of the dosage form, the dosage forms demonstrating resistance against attempted liberation of the hydrocodone or salt thereof from the dosage forms by manipulation, attempted isolation of the hydrocodone or salt thereof from said dosage form by chemical extraction, or both, prior to oral ingestion, intranasal insufflation, or intravenous injection. demonstrating resistance to pharmacokinetic changes, pharmacodynamic changes, or both, in response to attempted liberation of the hydrocodone or salt thereof from said dosage form by manipulation, attempted isolation of the hydrocodone or salt thereof from said dosage form by chemical extraction, or both, prior to oral ingestion, intranasal insufflation, or intravenous injection, as compared with the same dosage form that is not subjected to the manipulation or chemical extraction prior to oral ingestion. The present disclosure also pertains to extended release, abuse deterrent dosage forms comprising a plurality of coated granules each comprising a granule and a coating; the granule containing hydrocodone or salt thereof in an amount of about 20-30% by weight, ethylcellulose in an amount of about 30-50% by weight, and hydroxypropylmethyl cellulose in an amount of about 20-40% by weight; the coating containing ethylcellulose in an amount of about 20-35% by weight of the coated granule, and glyceryl behenate in an amount of about 10- 20% by weight of the coated granule; and, a matrix containing the plurality of granules and comprising hydroxypropylmethyl cellulose in an amount of about 5-12% by weight of the dosage form, and lactose in an amount of about 35-75% by weight of the dosage form, wherein manipulation of the dosage form, followed by extraction of the hydrocodone or salt thereof from the manipulated dosage form, provides extracted hydrocodone or salt thereof having a purity that reflects incomplete isolation of the hydrocodone or salt thereof from one or more other components of the dosage form. Also disclosed are extended release, abuse deterrent dosage forms comprising a plurality of coated granules each comprising a granule and a coating; the granule containing hydrocodone or salt thereof in an amount of about 20-30% by weight, ethylcellulose in an amount of about 30-50% by weight, and hydroxypropylmethyl cellulose in an amount of about 20-40% by weight; the coating containing ethylcellulose in an amount of about 20-35% by weight of the coated granule, and glyceryl behenate in an amount of about 10-20% by weight of the coated granule; and, a matrix containing the plurality of granules and comprising hydroxypropylmethyl cellulose in an amount of about 5-12% by weight of the dosage form, and lactose in an amount of about 35-75% by weight of the dosage form, the dosage form demonstrating resistance against attempted liberation of the hydrocodone or salt thereof from said dosage form by ingestion with alcohol by a subject. The present disclosure also pertains to methods of treating chronic pain comprising administering to a subject in need thereof a dosage form of any of the preceding types. In addition, provided are methods of reducing or mitigating alcohol-induced dose dumping of hydrocodone or salt thereof in a patient comprising administering to a patient a dosage form of any of the preceding types. FIG. 1 provides representative simulated oral ingestion data from a dosage form in accordance with the instant disclosure manipulated with two different tools. FIG. 2 depicts the effect of temperature extremes on the presently disclosed dosage forms using pretreatment at specific temperatures prior to manipulation. FIG. 3 illustrates the results of simulated nasal insufflation experiments. FIG. 4 shows the percent of drug recovered from manipulated dosage forms pursuant to studies designed to simulate intravenous manipulation. FIG. 5 depicts the results of extraction studies that were conducted to evaluate drug release in solvents representing readily available ingestible fluids. FIG. 6 depicts the results of additional extraction studies that were conducted to evaluate drug release in solvents representing readily available ingestible fluids. FIG. 7 provides data concerning the purity of hydrocodone in isolated residues from manipulated dosage forms. FIG. 8 shows the percent of drug recovered and the purity of drug recovered following multiple-step chemical extraction from manipulated dosage forms. FIG. 9 depicts the results of a study to evaluate the pharmacokinetic profile of manipulated dosage forms according to the present disclosure following oral ingestion. FIG. 10 depicts the results of a further study to evaluate the pharmacokinetic profile of manipulated dosage forms according to the present disclosure following oral ingestion. FIG. 11 depicts the results of a study to evaluate the pharmacokinetic profile of manipulated dosage forms according to the present disclosure following intranasal insufflation. FIG. 12 illustrates the results of a study to evaluate effect of alcohol on the pharmacokinetics of hydrocodone following oral administration of the intact dosage forms according to the present disclosure. FIG. 13 depicts the Mean Drug Liking Visual Analog Scale score (DLEQ Question 1) over time (0-8 hours) following oral administration of intact and manipulated dosage forms according to the present disclosure, as well as for immediate release hydrocodone API, and placebo. FIG. 14 shows the proportion of responders decreasing "at the moment" drug liking VAS Emax, pursuant to a pharmacodynamic evaluation of the presently disclosed dosage forms. FIG. 15 depicts mean drug liking scores over time in subjects who were administered intranasal doses of manipulated dosage forms according to the present disclosure, as well as other comparison materials. FIG. 16 shows the percent reduction in maximum drug liking for manipulated dosage forms according to the present disclosure vs. hydrocodone API and manipulated inventive dosage form following intranasal administration. FIG. 17 shows the percent reduction in maximum overall drug liking for manipulated dosage forms according to the present disclosure vs. hydrocodone API and manipulated inventive dosage form following intranasal administration. The present inventions may be understood more readily by reference to the following detailed description taken in connection with the accompanying figures and examples, which form a part of this disclosure. It is to be understood that these inventions are not limited to the specific products, methods, conditions or parameters described and/or shown herein, and that the terminology used herein is for the purpose of describing particular embodiments by way of example only and is not intended to be limiting of the claimed inventions. The entire disclosures of each patent, patent application, and publication cited or described in this document are hereby incorporated herein by reference. As employed above and throughout the disclosure, the following terms and abbreviations, unless otherwise indicated, shall be understood to have the following meanings. In the present disclosure the singular forms "a," "an," and "the" include the plural reference, and reference to a particular numerical value includes at least that particular value, unless the context clearly indicates otherwise. Thus, for example, a reference to "a particle" is a reference to one or more of such particles and equivalents thereof known to those skilled in the art, and so forth. Furthermore, when indicating that a certain element "may be" X, Y, or Z, it is not intended by such usage to exclude in all instances other choices for the element. "wherein 2 is not included." The present disclosure relates, inter alia, to abuse-deterrent and abuse-resistant dosage forms containing a hydrocodone or salt thereof. As noted above, the risks of abuse and the potential sequelae of overdose and death associated with prescription opioids pose a serious and growing public health risk and constitute a serious unmet medical need. In recognition of the growing epidemic of opioid abuse, dependence, and overdose in the United States, termed by many as a crisis, the United States Food and Drug Administration (FDA) has developed a comprehensive action plan, termed the FDA Opioids Action Plan, to take concrete steps toward reducing the impact of opioid abuse on American families and communities. One of the specific actions that the FDA has pursued is to expand access to abuse-deterrent formulations (ADFs) in order to decrease the incidence of abuse of prescription opioid medication. In order to assist the manufacturers of opioid-containing dosage forms with the development and deployment of abuse-deterrent formulations, the FDA has issued guidance providing the agency's recommendations for the approval standards for abuse-deterrent formulations. Using such guidance, the present inventors conducted abuse-deterrent evaluations of extended release hydrocodone dosage forms. The evaluation included manipulation and extraction studies, human pharmacokinetic studies, and human abuse potential studies as well as evaluation of loss and diversion data studies. Because opioid products are often manipulated for purposes of abuse by different routes of administration or to defeat extended release properties, some abuse-deterrent technologies are intended to make manipulation more difficult or to make abuse of the manipulated product less attractive or less rewarding. The fact that a product has abuse-deterrent properties does not mean that there is no risk of abuse. It means, rather, that the risk of abuse is lower than it would be without such properties. Because opioid products must, in the end, be able to deliver the opioid to the intended patient population, there may always be some risk for abuse of these products. /. Dosage forms resistant to manipulation. In some embodiments, the present extended release, abuse-deterrent dosage forms demonstrate resistance against attempted liberation of the hydrocodone or salt thereof from the dosage forms by manipulation, attempted isolation of the hydrocodone or salt thereof from the dosage forms by chemical extraction, or both, prior to oral ingestion, intranasal insufflation, or intravenous injection. The dosage forms comprise a plurality of coated granules each comprising a granule and a coating; the granule containing hydrocodone or salt thereof in an amount of about 20-30% by weight, ethylcellulose in an amount of about 30-50% by weight, and hydroxypropylmethyl cellulose in an amount of about 20-40% by weight; the coating containing ethylcellulose in an amount of about 20-35% by weight of the coated granule, and glyceryl behenate in an amount of about 10-20% by weight of the coated granule; and, a matrix containing the plurality of granules and comprising hydroxypropylmethyl cellulose in an amount of about 5-12% by weight of the dosage form, and lactose in an amount of about 35-75% by weight of the dosage form. bis(trifluoroacetate), hydrocodone chlorhydrate, and hydrocodone sulfate pentahydrate. In certain embodiments of the presently disclosed dosage forms, the hydrocodone is present as the bitartrate salt. As described infra in Examples 1-6, such dosage forms were subjected to testing in order to confirm these attributes, using studies that ranged from simple physical manipulations to the complex tampering techniques of a sophisticated abuser. Studies included tests to defeat the extended release characteristics of the dosage forms by cutting, crushing, milling, and grinding dosage forms. The results of such cutting, crushing, milling, or grinding can typically be said to result in a "comminuted" dosage form. Drug release was measured in a wide variety of solvents with varying temperatures and mixing conditions, including simulated oral ingestion, simulated intranasal and IV extraction, chemical extraction, and more complex multi-step chemical extractions. For in vitro physical manipulation, screening studies were conducted using 15 tools representing different mechanisms. As described more fully in the examples below, six tools that represent the range of destructive (effective) mechanisms were selected for use in the in vitro studies. These tools were selected to represent the various comminution mechanisms, and thereby represent the unlimited variety of tools of similar mechanism that might be available to abusers. The studies demonstrated the presently disclosed dosage forms present a barrier to the effect of manipulation for drug abuse. Extended-release properties were retained to a significant degree when the dosage forms were physically manipulated with a variety of tools and subjected to simulated oral ingestion and simulated intranasal extractions. The formulations also resisted extraction of the opioid into small volumes that simulate IV abuse conditions, and physically impeded injectability and syringeability. In the extraction studies, the dosage forms exhibited a barrier to hydrocodone extraction with ingestible household solvents. Simple and multiple-step chemical extractions with advanced solvents may be used to improve the extraction of hydrocodone for methodical abusers willing to invest time to defeat the controlled-release mechanism prior to each use. However, doing so would require significant time and effort, and these techniques would not result in the extraction of a pure opioid drug substance. Manipulated ZOHYDRO® ER dosage forms were employed as a comparator and exhibited much greater drug release (i.e., release of a greater amount when subjected to the same conditions) than the presently disclosed dosage forms when subjected to the simulated oral ingestion, simulated intranasal, simulated IV, and simple aqueous extractions. Overall, the in vitro studies demonstrated that the presently disclosed dosage forms substantially retain ER properties following chemical and physical manipulation compared to a non-abuse deterrent opioid formulation. During such studies, one objective was to determine whether such dosage forms conform to FDA guidance for the approval standards for abuse-deterrent formulations. For example, the inventive dosage forms demonstrate resistance against attempted liberation of the hydrocodone or salt thereof because, in accordance with FDA guidelines, less than 80% of the hydrocodone or salt thereof is released from the dosage form (i.e. , rendered available for direct uptake) during the 30 minutes following simulated oral ingestion. To the extent that an FDA standard is available with respect to a particular characteristic, a dosage form according to the present disclosure may conform to such standard. See General Principles for Evaluating the Abuse Deterrence of Generic Solid Oral Opioid Drug Products, U.S. Department of Health and Human Services, Food and Drug Administration, Center for Drug Evaluation and Research (CDER), March 2016, which is incorporated herein by reference. These properties represent resistance against attempted liberation of the hydrocodone or salt thereof, and are expected to deter abuse via the most common and widespread routes. releasing less than 47% by weight of the hydrocodone or salt thereof following intranasal insufflation of the dosage form after being subjected to in vitro manipulation for a period of up to 30 minutes, the in vitro manipulation being sufficient to render the dosage form into a powder; releasing less than 21% by weight of the hydrocodone or salt thereof following intravenous injection of the dosage form after being subjected to in vitro manipulation followed by combination with an extraction medium for a period of up to 1 minute; releasing less than 50% by weight of the hydrocodone or salt thereof following intravenous injection of the dosage form after being subjected to in vitro manipulation followed by combination with an extraction medium for a period of up to 1 minute; releasing less than 25% by weight of the hydrocodone or salt thereof following intravenous injection of the dosage form after being subjected to manipulation followed by combination with an extraction medium for a period of up to 5 minutes; releasing less than 35% by weight of the hydrocodone or salt thereof following intravenous injection of the dosage form after being subjected to in vitro manipulation followed by combination with an extraction medium for a period of up to 5 minutes; releasing less than 10% by weight of the hydrocodone or salt thereof after being subjected to manipulation, combined with a solvent, and being subjected to agitation for a period of up to 30 minutes; and, releasing less than 40% by weight of the hydrocodone or salt thereof after being subjected to manipulation, combined with a solvent, and being subjected to agitation for a period of up to 120 minutes. Common manipulation tactics can include one or more of breaking, cutting, splitting, crushing, milling, and grinding the dosage form. As used herein, "manipulation" can also or alternatively refer to combining the dosage form with one or more solvents and optionally subjecting the combination of the dosage form and one or more solvents to agitation. For example, manipulation can include grinding the dosage form, followed by combining the resulting powder with a solvent, and mixing the combination for a desired period of time. In other instances, the combination of ground dosage form and solvents are not mixed. In still other instances of manipulation, the dosage forms are subjected to grinding, and are not subsequently combined with a solvent. Alternatively, an intact dosage form is combined with one or more solvents and optionally subjected to agitation. The present dosage forms demonstrate the aforementioned resistance against attempted liberation of the hydrocodone or salt thereof when exposed to any one or more of such manipulation tactics. Attempts to liberate an active ingredient using manipulation can have any duration that the prospective abuser of the dosage form is willing to undertake. The present dosage forms can endure long but finite periods of manipulation and still maintain the resistance against attempted liberation of the active agent. For example, the manipulation can have a duration of up to 30 minutes, up to 40 minutes, up to 50 minutes, up to 60 minutes, up to 70 minutes, up to 80 minutes, up to 90 minutes, up to 100 minutes, up to 110 minutes, up to 120 minutes, up to 130 minutes, up to 140 minutes, or up to 150 minutes. As used herein "up to x" means anything less than x and also including exactly x. The manipulation can also have a duration of about 5 minutes to about 10 minutes, about 10 minutes to about 20 minutes, about 10 minutes to about 30 minutes, about 20 minutes to about 30 minutes, about 30 minutes to about 40 minutes, about 30 minutes to about minutes, about 30 minutes to about 60 minutes, about 40 minutes to about 80 minutes, about 60 minutes to about 100 minutes, about 60 minutes to about 120 minutes, about 80 minutes to about 120 minutes, about 90 minutes to about 120 minutes, about 100 minutes to about 120 minutes, about 110 minutes to about 130 minutes, about 110 minutes to about 150 minutes, or about 120 minutes to about 150 minutes. In certain embodiments, the demonstrated resistance to the manipulation includes releasing less than 50% by weight of the hydrocodone or salt thereof following oral ingestion of the dosage form after being subjected to manipulation for a period of up to 30 minutes. In other embodiments, the demonstrated resistance to the manipulation includes releasing less than 45% by weight of the hydrocodone or salt thereof following oral ingestion of the dosage form after being subjected to manipulation for a period of up to 30 minutes. In other instances, the demonstrated resistance to the manipulation includes releasing less than 30%, less than 25%, less than 20%, less than 15%, or less than 10% by weight of the hydrocodone or salt thereof following oral ingestion of the dosage form after being subjected to manipulation for a period of up to 30 minutes. The phrase "the dosage form after being subjected to manipulation" is meant to refer to the physical remains of the dosage form (e.g. , comminuted) that exists after the manipulation. As used herein, "release" of hydrocodone or salt thereof is expressed in terms of that which can be measured under simulated oral ingestion, nasal insufflation, or intravenous injection conditions as described below in Example 1. In some embodiments, the demonstrated resistance to the manipulation includes releasing less than 70% by weight of the hydrocodone or salt thereof following oral ingestion of the dosage form after being subjected to manipulation for a period of up to 120 minutes. In other instances, the demonstrated resistance to the manipulation includes releasing less than 60%, less than 55%, less than 50%, less than 45%, less than 40%, or less than 37% by weight of the hydrocodone or salt thereof following oral ingestion of the dosage form after being subjected to manipulation for a period of up to 120 minutes. In other embodiments, the demonstrated resistance of the presently disclosed dosage forms to the manipulation includes releasing less than 15% by weight of the hydrocodone or salt thereof following intranasal insufflation of the dosage form after being subjected to manipulation for a period of up to 10 minutes, the manipulation being sufficient to render the dosage form into a powder. In other embodiments, the demonstrated resistance of the presently disclosed dosage forms to the manipulation includes releasing less than 14%, less than 13%, less than 12%, less than 11%, less than 10%, less than 9%, less than 7%, less than 6%, less than 5%, less than 4%, less than 3%, or less than 2% by weight of the hydrocodone or salt thereof following intranasal insufflation of the dosage form after being subjected to manipulation for a period of up to 10 minutes, the manipulation being sufficient to render the dosage form into a powder. The demonstrated resistance to the manipulation may also or alternatively include releasing less than 20% by weight of the hydrocodone or salt thereof following intranasal insufflation of the dosage form after being subjected to manipulation for a period of up to 30 minutes, the manipulation being sufficient to render the dosage form into a powder. In other embodiments, the demonstrated resistance to the manipulation may also or alternatively include releasing less than 19%, less than 18%, less than 16%, less than 15%, less than 12%, less than 10%, less than 8%, less than 6%, or less than 5% by weight of the hydrocodone or salt thereof following intranasal insufflation of the dosage form after being subjected to manipulation for a period of up to 30 minutes, the manipulation being sufficient to render the dosage form into a powder. The demonstrated resistance by the presently disclosed dosage forms to the manipulation can include releasing less than 25% by weight of the hydrocodone or salt thereof following intravenous injection of the dosage form after being subjected to manipulation followed by combination with an extraction medium for a period of up to 5 minutes. In other instances, demonstrated resistance by the presently disclosed dosage forms to the manipulation can include releasing less than 24%, less than 22%, less than 20%, less than 18%, less than 16%, less than 14%, less than 12%, less than 10%, or less than 8% by weight of the hydrocodone or salt thereof following intravenous injection of the dosage form after being subjected to manipulation followed by combination with an extraction medium for a period of up to 5 minutes. The present dosage forms may also or alternatively demonstrate resistance to attempted isolation of the hydrocodone or salt thereof from the dosage form by chemical extraction. The forms of attempted chemical extraction from a dosage form by a potential abuser can range from simple to complex. The various techniques for chemical extraction may simply liberate the opioid from the extended release mechanism of the dosage form in a solvent, or may separate the opioid to some extent from the tablet excipients, resulting in a solid residue. The latter technique is intended to increase the purity of the material extracted. In order of increasing level of complexity the following extraction techniques were considered in order to assess the characteristic of the presently disclosed dosage forms relating to resistance to attempted chemical extraction of the hydrocodone or salt thereof: 1) simple chemical extraction intended for oral ingestion of the resulting potable extraction solution; 2) relatively simple extractions using an advanced organic solvent with isolation of the drug residue from the solvent prior to abuse (with the resulting residue to be ingested, snorted, or reconstituted for injection); and, 3) complex, multiple-step, multiple-solvent extractions and separations intended to purify the opioid freebase. Example 2, infra, describes exemplary protocols for assessing the resistance by the presently disclosed dosage forms to attempted chemical extraction of the hydrocodone or salt thereof. In certain embodiments, the chemical extraction includes combining the dosage form with the solvent. The solvent may be, for example, aqueous or organic. The dosage form may be subjected to milling, cutting, grinding, crushing, or any combination thereof prior to combining the material resulting therefrom with a solvent. The chemical extraction may further comprise subjecting the combination of the solvent and the material that results from the milling, cutting, grinding, or crushing to agitation. The agitation may have any desired duration, for example, a duration that is likely to be undertaken pursuant to attempted abuse of the dosage form, such as up to 5 minutes, up to 10 minutes, up to 15 minutes, up to 20 minutes, up to 25 minutes, up to 30 minutes, up to 35 minutes, up to 40 minutes, up to 45 minutes, up to 50 minutes, up to 55 minutes, up to 60 minutes, up to 70 minutes, up to 80 minutes, up to 90 minutes, up to 100 minutes, up to 110 minutes, or up to 120 minutes. Agitation may include one or more of stirring, shaking, blending, and the like. For example, the agitation may make use of conventional equipment, or it may embrace one or more inversions of a vessel containing the manipulated dosage form in order to ensure wetting thereof. embodiments, the demonstrated resistance to the manipulation includes releasing less than 40%, less than 39%, less than 38%, less than 37%, less than 36%, less than 35%, less than 34%, or less than 33% by weight of the hydrocodone or salt thereof after being subjected to manipulation, combined with the solvent for a period of up to 120 minutes, and optionally being subjected to agitation during this period. The demonstrated resistance by the presently disclosed dosage forms to attempted isolation of the hydrocodone or salt thereof from the dosage form by chemical extraction may be under conditions in which the chemical extraction includes isolation of a residue resulting from the combination of the manipulated dosage form and the solvent, wherein the residue contains the hydrocodone or salt thereof. In such embodiments, the solvent may be, for example, an organic solvent or a combination of two or more such solvents. In other embodiments of the presently disclosed dosage forms, the demonstrated resistance by the presently disclosed dosage forms to attempted isolation of the hydrocodone or salt thereof from the dosage form by chemical extraction may be under conditions in which the chemical extraction includes multiple step liquid-liquid extraction. In such embodiments, the solvent may be, for example, an organic solvent or a combination of two or more such solvents. As noted previously, representative multiple step liquid-liquid extraction techniques are described in Example 2. With respect to any of the preceding embodiments, the presently disclosed dosage forms may comprise a coated granule that contains hydrocodone or a salt thereof in an amount of about 25-30% by weight, ethylcellulose in an amount of about 35-45% by weight, and hydroxypropylmethyl cellulose in an amount of about 25-35% by weight; a coating that contains ethylcellulose in an amount of about 23-40% by weight of the coated granule, and glyceryl behenate in an amount of about 10-15% by weight of the coated granule; and, a matrix that comprises hydroxypropylmethyl cellulose in an amount of about 5-12% by weight of the dosage form, and lactose in an amount of about 40-75% by weight of the dosage form. In any of the above-described dosage forms, the weight of the granule may be in a ratio of about 60:40 relative to the coating. The present disclosure also provides methods of treating chronic pain comprising administering to a subject in need thereof a dosage form according to any one of the above-described embodiments. For example, the present methods may be used to treat abdominal pain, pain from arachnoiditis, pain from osteo- or rheumatoid arthritis, back pain, pain from chronic fatigue syndrome, pain from complex regional pain syndrome, pain from conversion disorder, pain from degenerative disc disease, facial pain, pain from fibromyalgia, foot or leg pain, headache pain, hip pain, pain from irritable bowel syndrome, knee pain, neck pain, nerve pain, pain from post-herpetic neuralgia, pain from trigeminal neuralgia, pain from diabetic neuropathy, pain from peripheral neuropathy, phantom limb pain, pain from piriformis syndrome, post-surgical pain, pain from reflex sympathetic dystrophy, pain from sciatica, shoulder pain, or pain from temporomandibular joint disorder. Because the presently disclosed dosage forms provide extended release, dosing should be selected according to a regimen that appropriately corresponds to this release profile. Those of ordinary skill in the art can readily identify and select appropriate dosing regimens. Also disclosed are dosage forms demonstrating resistance to pharmacokinetic changes, pharmacodynamic changes, or both, in response to attempted liberation of hydrocodone or salt thereof from said dosage form by manipulation, attempted isolation of the hydrocodone or salt thereof from said dosage form by chemical extraction, or both, prior to oral ingestion, intranasal insufflation, or intravenous injection, as compared with the same dosage form that is not subjected to the manipulation or chemical extraction prior to oral ingestion. The dosage forms of this type comprise a plurality of coated granules each comprising a granule and a coating; the granule containing hydrocodone or salt thereof in an amount of about 20-30% by weight, ethylcellulose in an amount of about 30-50% by weight, and hydroxypropylmethyl cellulose in an amount of about 20-40% by weight; the coating containing ethylcellulose in an amount of about 20-35% by weight of the coated granule, and glyceryl behenate in an amount of about 10-20% by weight of the coated granule; and, a matrix containing the plurality of granules and comprising hydroxypropylmethyl cellulose in an amount of about 5-12% by weight of the dosage form, and lactose in an amount of about 35-75% by weight of the dosage form. The pharmacokinetic profile of an opioid dosage form is important in determining its abuse potential. By manipulating an extended release formulation, many abusers seek to accelerate the release of the drug product resulting in a more rapid "high". The effect results in a much higher peak serum concentration over a shorter duration of time. This change in the pharmacokinetic profile typically results in an increased subjective response (i.e., euphoria). An opioid's abuse quotient (AQ) is a numerical measurement of the rate of rise (Cmax tmax) achieved by the drug in the blood and brain when the formulation is manipulated by an abuser (Moorman-Li et al 2012). The AQ is thought to contribute to differential abuse potential among drugs, formulations, and ROAs (Abreu et al 2001, de Wit et al 1992, de Wit et al 1993). A lower AQ indicates a slower rate of rise, and is one parameter that may indicate lower abuse potential compared to the reference. When taken as intended, the presently disclosed dosage forms possess a lower potential for abuse compared to IR formulations due to a slower onset with a lower Cmax and later tmax. Pharmacokinetic data was obtained with respect to the presently disclosed dosage forms in order to characterize the pharmacokinetics of manipulated dosage forms following oral and intranasal administration, and the impact of alcohol ingestion on hydrocodone exposure following oral administration of intact dosage form. In certain embodiments, the demonstrated pharmacokinetic resistance to the manipulation includes producing an average Cmax following oral ingestion of the dosage form after being subjected to manipulation that is no more than about 75% greater than the average Cmax for the dosage form when it is not subjected to the manipulation. Common manipulation tactics can include one or more of breaking, cutting, splitting, crushing, milling, and grinding the tablet. The present dosage forms demonstrate the aforementioned resistance against attempted liberation of the hydrocodone or salt thereof when exposed to any one or more of such tactics. Attempts to liberate an active ingredient using manipulation can have any duration that the prospective abuser of the dosage form is willing to undertake. The present dosage forms can endure long but finite periods of manipulation and still maintain the resistance against attempted liberation of the active agent. For example, the manipulation can have a duration of up to 30 minutes, up to 40 minutes, up to 50 minutes, up to 60 minutes, up to 70 minutes, up to 80 minutes, up to 90 minutes, up to 100 minutes, up to 110 minutes, up to 120 minutes, up to 130 minutes, up to 140 minutes, or up to 150 minutes. As used herein "up to x" means anything less than x and also including exactly x. The manipulation can also have a duration of about 5 minutes to about 10 minutes, about 10 minutes to about 20 minutes, about 10 minutes to about 30 minutes, about 20 minutes to about 30 minutes, about 30 minutes to about 40 minutes, about 30 minutes to about minutes, about 30 minutes to about 60 minutes, about 40 minutes to about 80 minutes, about 60 minutes to about 100 minutes, about 60 minutes to about 120 minutes, about 80 minutes to about 120 minutes, about 90 minutes to about 120 minutes, about 100 minutes to about 120 minutes, about 110 minutes to about 130 minutes, about 110 minutes to about 150 minutes, or about 120 minutes to about 150 minutes. In certain embodiments, the demonstrated pharmacokinetic resistance to manipulation includes producing a tmax following oral ingestion of the dosage form after being subjected to manipulation that occurs in no sooner than about 36% of the time for the dosage form when it is not subjected to the manipulation. Also or alternatively, the demonstrated pharmacokinetic resistance to manipulation may include producing an AUCo-∞ following oral ingestion of the dosage form after being subjected to manipulation that is no more than about 10% greater than the AUCo-∞ for the dosage form when it is not subjected to the manipulation. demonstrated pharmacokinetic resistance to manipulation includes producing an AUCo-∞ following oral ingestion of the dosage form after being subjected to manipulation that is no more than about 1% greater than the AUCo-∞ for the dosage form when it is not subjected to the manipulation. Example 7a describes experiments to determine pharmacokinetic parameters for manipulated and intact dosage forms according to the present disclosure following oral administration. The presently disclosed dosage forms can also include pharmacokinetic resistance to manipulation when the dosage form is intranasally insufflated. In certain embodiments, the demonstrated pharmacokinetic resistance to manipulation includes producing a Cmax following intranasal insufflation of the dosage form after being subjected to manipulation that is no more than about 230% greater than the Cmax for the dosage form when it is not subjected to the manipulation and when it is orally ingested. In some embodiments, the demonstrated pharmacokinetic resistance to manipulation includes producing a Cmax following intranasal insufflation of the dosage form after being subjected to manipulation that is no more than about 85% of the Cmax for intranasally insufflated hydrocodone bitartrate API. In some embodiments, the demonstrated pharmacokinetic resistance to manipulation includes producing an tmax following intranasal insufflation of the dosage form after being subjected to manipulation that occurs in no sooner than about 25% of the time for the dosage form when it is not subjected to the manipulation and when it is orally ingested. In certain embodiments, the demonstrated pharmacokinetic resistance to manipulation includes producing a tmax following intranasal insufflation of the dosage form after being subjected to in vitro manipulation that occurs in at least 190% of the time corresponding to the tmax for intranasally insufflated hydrocodone bitartrate API. Example 8 describes experiments to determine pharmacokinetic parameters for manipulated dosage forms according to the present disclosure following intranasal insufflation, as compared with the pharmacokinetic parameters for intact dosage forms following oral ingestion. In the first study, statistically significant reductions in peak "at the moment" drug liking and overall drug liking were observed following oral administration of manipulated inventive dosage form compared with hydrocodone bitartrate API. In the second study, peak "at the moment" drug liking and overall drug liking for manipulated inventive dosage form administered via the intranasal route were significantly lower compared to intranasally administered hydrocodone bitartrate API and ZOHYDRO ER. In both studies, the intact oral inventive dosage form showed a similar profile to placebo. Therefore, the results of the human abuse potential studies indicate that the presently disclosed dosage forms have lower abuse potential via two common routes of abuse reported for opioid analgesics (i.e., oral and intranasal) compared with non-abuse deterrent opioid products. Therefore, data from the clinical abuse potential studies, along with support from the in vitro data, also indicate that the instant dosage forms have physicochemical properties that are expected to reduce abuse via the oral route when manipulated and via the intranasal route. 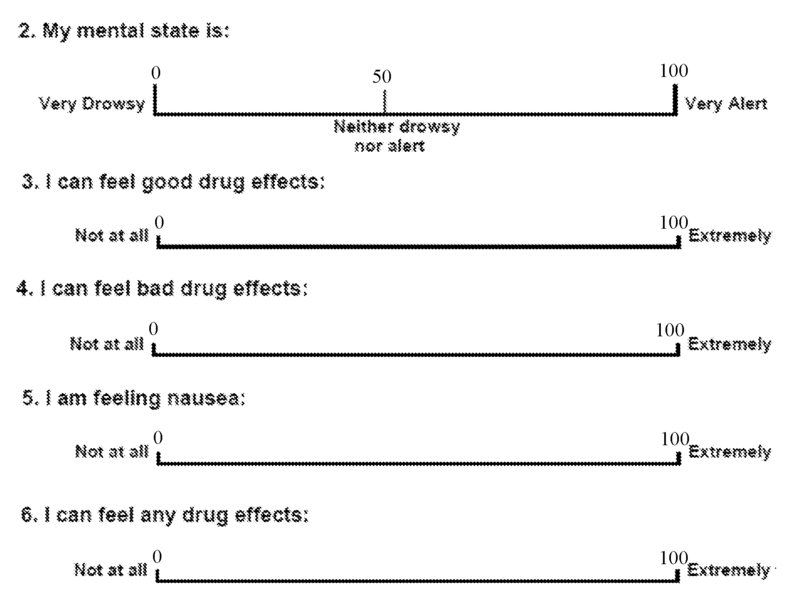 manipulation includes producing a mean overall drug liking effect score following oral ingestion of the dosage form after being subjected to manipulation that is no more than about 20% greater than the mean overall drug liking effect score for the dosage form when it is not subjected to the manipulation and when it is orally ingested. The present dosage forms may also or alternatively contain 45 mg of hydrocodone or a salt thereof, and the demonstrated pharmacodynamic resistance to manipulation includes producing a mean maximum drug liking effect score following oral ingestion of the dosage form after being subjected to manipulation that is no more than about 25% greater than the mean maximum drug liking effect score for the dosage form when it is not subjected to the manipulation and when it is orally ingested. manipulation and when it is orally ingested. hydroxypropylmethyl cellulose in an amount of about 25-35% by weight; a coating that contains ethylcellulose in an amount of about 23-40% by weight of the coated granule, and glyceryl behenate in an amount of about 10-15% by weight of the coated granule; and, a matrix that comprises hydroxypropylmethyl cellulose in an amount of about 5-12% by weight of the dosage form, and lactose in an amount of about 40-75% by weight of the dosage form. pharmacodynamic resistance to manipulation. For example, the present methods may be used to treat abdominal pain, pain from arachnoiditis, pain from osteo- or rheumatoid arthritis, back pain, pain from chronic fatigue syndrome, pain from complex regional pain syndrome, pain from conversion disorder, pain from degenerative disc disease, facial pain, pain from fibromyalgia, foot or leg pain, headache pain, hip pain, pain from irritable bowel syndrome, knee pain, neck pain, nerve pain, pain from post-herpetic neuralgia, pain from trigeminal neuralgia, pain from diabetic neuropathy, pain from peripheral neuropathy, phantom limb pain, pain from piriformis syndrome, post-surgical pain, pain from reflex sympathetic dystrophy, pain from sciatica, shoulder pain, or pain from temporomandibular joint disorder. Because the presently disclosed dosage forms provide extended release, dosing should be selected according to a regimen that appropriately corresponds to this release profile. Those of ordinary skill in the art can readily identify and select appropriate dosing regimens. The present disclosure also provides dosage forms that yield hydrocodone or a salt thereof having a purity that reflects incomplete isolation of the drug substance from one or more other components of the dosage form when the dosage form is subjected to manipulation and extraction of the hydrocodone or salt thereof. A sophisticated abuser may attempt to employ advanced extraction techniques in order to obtain relatively pure opioid that is more suitable for abuse by any route, whether oral ingestion, intranasal insufflation, or intravenous injection. However, the present dosage forms possess characteristics that would thwart any such attempts by yielding low purity hydrocodone or salt thereof that reflects incomplete isolation of the drug from one or more of the other components of the dosage form, such as any of the excipients, or any other component that is formulated into the dosage form with the active ingredient. The relatively low degree of hydrocodone purity that results from the manipulation and extraction will not provide the degree of drug effect that the attempted abuser seeks, and the presently disclosed dosage forms therefore deter abuse using such techniques. The dosage forms of this type comprise a plurality of coated granules each comprising a granule and a coating; the granule containing hydrocodone or salt thereof in an amount of about 20-30% by weight, ethylcellulose in an amount of about 30-50% by weight, and hydroxypropylmethyl cellulose in an amount of about 20-40% by weight; the coating containing ethylcellulose in an amount of about 20-35% by weight of the coated granule, and glyceryl behenate in an amount of about 10-20% by weight of the coated granule; and, a matrix containing the plurality of granules and comprising hydroxypropylmethyl cellulose in an amount of about 5-12% by weight of the dosage form, and lactose in an amount of about 35-75% by weight of the dosage form. In certain embodiments, the purity of the hydrocodone or salt thereof that is extracted from the presently disclosed dosage forms is less than 20% by weight following manipulation of the dosage form, combination of the results of the manipulation with a solvent, agitating the combination for a period of up to 30 minutes, and removing the solvent in order to produce the extracted hydrocodone or salt thereof. The extraction of the hydrocodone or salt thereof may comprise combining the manipulated dosage form with a solvent, and subsequently removing the solvent in order to produce a residue containing the hydrocodone or salt thereof. Exemplary solvents for combining with the dosage form include solvents that are aqueous, organic, or both. The extraction of the hydrocodone or salt thereof may also comprise agitating the combination of the manipulated dosage form and solvent. The agitation may have any desired duration, for example, a duration that is likely to be undertaken pursuant to attempted abuse of the dosage form, such as up to 5 minutes, up to 10 minutes, up to 15 minutes, up to 20 minutes, up to 25 minutes, up to 30 minutes, up to 35 minutes, up to 40 minutes, up to 45 minutes, up to 50 minutes, up to 55 minutes, up to 60 minutes, up to 70 minutes, up to 80 minutes, up to 90 minutes, up to 100 minutes, up to 110 minutes, or up to 120 minutes. Agitation may include one or more of stirring, shaking, blending, and the like. For example, the agitation may make use of conventional equipment. In other embodiments, the purity of the hydrocodone or salt thereof that is extracted from the presently disclosed dosage forms may be less than 15% by weight following manipulation of the dosage form, combination of the results of the manipulation with a solvent, agitating the combination for a period of up to 30 minutes, and removing the solvent in order to produce the extracted hydrocodone or salt thereof. The extraction of the hydrocodone or salt thereof may include a multiple step liquid-liquid extraction from the manipulated dosage form. Representative multiple step liquid- liquid extraction techniques are described in Example 2. Exemplary solvents that are used in the multiple step liquid-liquid extraction include an organic solvent or a mixture of two or more organic solvents. When multiple step liquid-liquid extraction is used, the purity of the extracted hydrocodone or salt thereof from the presently disclosed dosage forms may be less than 80%, less than 70%, less than 60%, or less than 50% by weight following manipulation of the dosage form, subjecting the results of the manipulation to a multiple step liquid-liquid extraction procedure, and removing the solvent from the extraction procedure to produce the extracted hydrocodone or salt thereof. In other embodiments, the purity of the extracted hydrocodone or salt thereof is less than 40% by weight following manipulation of the dosage form, subjecting the results of the manipulation to a multiple step liquid-liquid extraction procedure, and removing the solvent from the extraction procedure to produce the extracted hydrocodone or salt thereof. Example 6, part c, infra, describes experiments demonstrating that the present dosage forms yield low purity hydrocodone when attempts are made to manipulate the dosage forms in order to extract the hydrocodone. With respect to any of the preceding embodiments of dosage forms that yield hydrocodone or a salt thereof having a purity that reflects incomplete isolation of the drug substance from one or more other components of the dosage form when the dosage form is subjected to manipulation and extraction, the dosage forms may comprise a granule that contains hydrocodone or a salt thereof in an amount of about 25-30% by weight, ethylcellulose in an amount of about 35-45% by weight, and hydroxypropylmethyl cellulose in an amount of about 25-35% by weight; a coating that contains ethylcellulose in an amount of about 23-40% by weight of the coated granule, and glyceryl behenate in an amount of about 10-15% by weight of the coated granule; and, a matrix that comprises hydroxypropylmethyl cellulose in an amount of about 5-12% by weight of the dosage form, and lactose in an amount of about 40-75% by weight of the dosage form. The present disclosure also provides methods of treating chronic pain comprising administering to a subject in need thereof a dosage form according to any one of the above-described embodiments of dosage forms that yield hydrocodone or a salt thereof having a purity that reflects incomplete isolation of the drug substance from one or more other components of the dosage form when the dosage form is subjected to manipulation and extraction. For example, the present methods may be used to treat abdominal pain, pain from arachnoiditis, pain from osteo- or rheumatoid arthritis, back pain, pain from chronic fatigue syndrome, pain from complex regional pain syndrome, pain from conversion disorder, pain from degenerative disc disease, facial pain, pain from fibromyalgia, foot or leg pain, headache pain, hip pain, pain from irritable bowel syndrome, knee pain, neck pain, nerve pain, pain from postherpetic neuralgia, pain from trigeminal neuralgia, pain from diabetic neuropathy, pain from peripheral neuropathy, phantom limb pain, pain from piriformis syndrome, post-surgical pain, pain from reflex sympathetic dystrophy, pain from sciatica, shoulder pain, or pain from temporomandibular joint disorder. Because the presently disclosed dosage forms provide extended release, dosing should be selected according to a regimen that appropriately corresponds to this release profile. Those of ordinary skill in the art can readily identify and select appropriate dosing regimens. Disclosed herein are dosage forms having a pharmacokinetic profile that is substantially unaffected by ingestion with alcohol. Oral administration of such dosage forms with alcohol have no effect on hydrocodone systemic exposure as measured by either Cmax or area under the plasma concentration curve (AUC), which were bioequivalent when the dosage forms are taken with water or 4%, 20%, and 40% alcohol solutions. When comparing two different products with the same active pharmaceutical ingredient, bioequivalence may be established, for example, by similar AUC and Cmax values in accordance with regulatory agency bioequivalence guidance (such as that used by the United States Food and Drug Administration (FDA)). These results demonstrate that co-ingestion of the dosage forms with alcoholic beverages in an attempt by abusers to produce immediate release of opioid will not be successful. Similar protection may be provided against unintentional misuse if a patient inadvertently uses alcohol in proximity to their legitimate use of the dosage form. However, as is the case for all dosage forms containing opioids, co-administration with alcohol is still contraindicated. The dosage forms demonstrating resistance against attempted liberation of hydrocodone or salt thereof from the dosage form by ingestion with alcohol comprise a plurality of coated granules each comprising a granule and a coating; the granule containing hydrocodone or salt thereof in an amount of about 20-30% by weight, ethylcellulose in an amount of about 30- 50% by weight, and hydroxypropylmethyl cellulose in an amount of about 20-40% by weight; the coating containing ethylcellulose in an amount of about 20-35% by weight of the coated granule, and glyceryl behenate in an amount of about 10-20% by weight of the coated granule; and, a matrix containing the plurality of granules and comprising hydroxypropylmethyl cellulose in an amount of about 5-12% by weight of the dosage form, and lactose in an amount of about 35-75% by weight of the dosage form. hydrocodone hemipentahydrate, hydrocodone bitartrate hemipentahydrate, hydrocodone pentafluoropropionate, hydrocodone p-nitrophenylhydrazone, hydrocodone o-methyloxime, hydrocodone semicarbazone, hydrocodone hydrobromide, hydrocodone mucate, hydrocodone oleate, hydrocodone phosphate dibasic, hydrocodone phosphate monobasic, hydrocodone inorganic salt, hydrocodone organic salt, hydrocodone acetate trihydrate, hydrocodone bis(heptafluorobutyrate), hydrocodone bis(methylcarbamate), hydrocodone bis(pentafluoropropionate), hydrocodone bis(pyridine carboxylate), hydrocodone bis(trifluoroacetate), hydrocodone chlorhydrate, and hydrocodone sulfate pentahydrate. In certain embodiments of the presently disclosed dosage forms, the hydrocodone is present as the bitartrate salt. As used herein, "ingestion with alcohol" is intended to embrace ingestion of alcohol by the subject within a temporal proximity to the ingestion by any route (e.g., oral or intranasal) that would otherwise create a risk of changing the pharmacokinetic profile of the dosage form. The ingestion of the dosage form could therefore occur at the same time as alcohol (e.g., by using alcohol to wash down the dosage form), or within a certain period of time before or after alcohol ingestion. Exemplary periods of time between the ingestion of the alcohol and the ingestion of the dosage form (regardless of which occurs first) are about 5 minutes, about 10 minutes, about 15 minutes, about 20 minutes, about 25 minutes, about 30 minutes, about 35 minutes, about 40 minutes, about 45 minutes, about 50 minutes, about 55 minutes, about 60 minutes, about 65 minutes, about 70 minutes, about 75 minutes, about 80 minutes, about 85 minutes, about 90 minutes, about 100 minutes, about 110 minutes, about 120 minutes, about 3 hours, about 3.5 hours, about 4 hours, about 4.5 hours, about 5 hours, about 5.5. hours, about 6 hours, or greater than about 6 hours. The quantity of alcohol (by total quantity of ethanol, not volume of the ethanol-containing beverage) that is ingested influences whether the amount of time between the ingestion of the alcohol and the ingestion of an opioid dosage form would otherwise create a risk of changing the pharmacokinetic profile of the dosage form, especially when the alcohol is ingested first. In particular, if a relatively small quantity of alcohol is consumed, then the period of time during which such a risk occurs is reduced, whereas the period of time is greater if more alcohol is consumed. The alcoholic beverage that the subject ingests may be a traditionally lower alcohol beverage, such as beer (typically having an ethanol content of between about 4% and about 6% in the U.S.), may be a beverage having an intermediate quantity of alcohol per volume (such as wine, which typically has an ethanol content of about 9- 16% by volume), or may be higher alcohol content beverage (e.g., spirits, which may range between about 30-80% by volume ethanol). Thus, the alcohol may have a total ethanol content of about 4%, about 5%, about 6%, about 7%, about 8%, about 9%, about 10%, about 12%, about 14%, about 16%, about 18%, about 20%, about 22%. about 24%, about 26%, about 28%, about 30%, about 32%, about 34%, about 36%, about 38%, about 40%, about 42%, about 44%, about 46%, about 48%, about 50%, about 55%, about 60%, about 65%, about 70%, about 75%, or about 80% by volume. The demonstrated resistance by a dosage form according to the present disclosure may comprise one or more pharmacokinetic parameters when ingested with alcohol that are bioequivalent to pharmacokinetic parameters that result from ingestion of the dosage form in the absence of alcohol. In some cases, at least two, at least three, or at least four of the pharmacokinetic parameters of the presently disclosed dosage forms when they are ingested with alcohol will be bioequivalent to corresponding pharmacokinetic parameters that result from ingestion of the dosage form in the absence of alcohol. The present dosage forms may produce an average Cmax when orally ingested with alcohol that is no more than 10% greater than the average Cmax for the dosage form when it is not ingested with alcohol. The dosage forms disclosed herein may also or alternatively produce an average tmax when orally ingested with alcohol that occurs in no sooner than about 75% of the average time for the dosage form when it is not ingested with alcohol. The present dosage forms may alternatively produce an average tmax when orally ingested with alcohol that occurs no sooner than the average tmax for the dosage form when it is not ingested with alcohol. The present dosage forms may also or alternatively produce an average AUCo-∞ when orally ingested with alcohol that is no more than about 15% greater than the average AUCo-∞ for the dosage form when it is not ingested with alcohol. In some embodiments, the present dosage forms produce an average AUCo-∞ when orally ingested with alcohol that is no more than about 10% greater than the average AUCo-∞ for the dosage form when it is not ingested with alcohol. Example 8, infra, describes a study that was conducted in order to evaluate the pharmacokinetics of hydrocodone bitartrate in a subject that ingested intact dosage forms according to the present disclosure with alcohol. pharmacodynamic resistance to manipulation. For example, the present methods may be used to treat abdominal pain, pain from arachnoiditis, pain from osteo- or rheumatoid arthritis, back pain, pain from chronic fatigue syndrome, pain from complex regional pain syndrome, pain from conversion disorder, pain from degenerative disc disease, facial pain, pain from fibromyalgia, foot or leg pain, headache pain, hip pain, pain from irritable bowel syndrome, knee pain, neck pain, nerve pain, pain from post-herpetic neuralgia, pain from trigeminal neuralgia, pain from diabetic neuropathy, pain from peripheral neuropathy, phantom limb pain, pain from piriformis syndrome, post-surgical pain, pain from reflex sympathetic dystrophy, pain from sciatica, shoulder pain, or pain from temporomandibular joint disorder. Also disclosed herein are methods reducing or mitigating alcohol-induced dose dumping of hydrocodone or a salt thereof in a subject comprising administering to the subject a dosage form according to any one of the above-described embodiments of dosage forms demonstrating pharmacokinetic or pharmacodynamic resistance to manipulation. Because the presently disclosed dosage forms provide extended release, dosing pursuant to any of the presently disclosed methods should be selected according to a regimen that appropriately corresponds to this release profile. Those of ordinary skill in the art can readily identify and select appropriate dosing regimens. The following examples are set forth so as to provide those of ordinary skill in the art with a complete disclosure and description of how the methods, compositions, and components claimed herein are made and evaluated, and are intended to be purely exemplary of the invention and are not intended to limit the scope of what the inventors regard as their invention. The data disclosed herein results from experiments that are repeated multiple times for each described test material and set of conditions. Each repetition may be referred to as a replicate. In each instance, at least three replicates were performed, and, in some instances, at least six replicates were performed. For example, the studies concerning simulated oral ingestion that are described below involved at least six replicates when the test material was an inventive dosage form, and involved at least three replicates when the test material was hydrocodone API, IR VICOPROFEN, or ZOHYDRO ER. Na2HP04, and 1.1 g NaH2P04 in 1 liter of water, pH 6.0-7.0) and the dissolution volume of 10 mL of simulated nasal fluid were based on information reported in the primary literature (Lorin et al 1972, Martinac et al 2005, Cole et al 1999). A platform shaker at 100 rpm was used for agitation to simulate the motion of cilia, and samples were withdrawn after 10 minutes and 30 minutes. Simulated insufflation experiments were conducted for all VANTRELA ER tablet strengths utilizing manipulation tools capable of one or more of cutting, crushing, milling, and grinding. 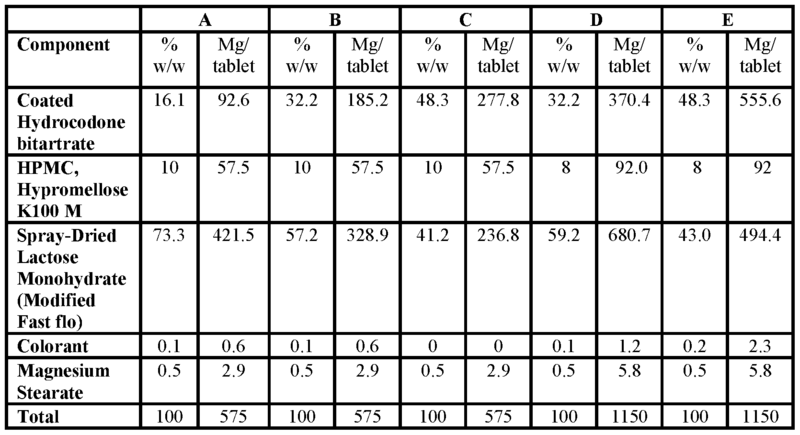 Sample preparations differed among dosage form strengths. 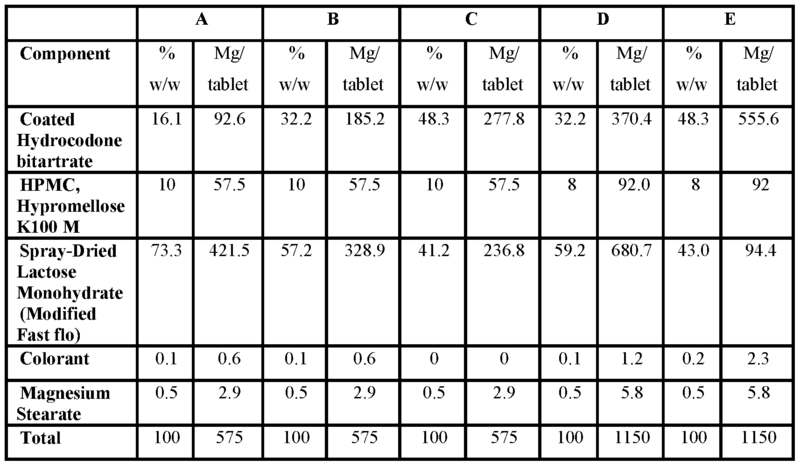 Lower strength (15, 30, and 45 mg) tablets, each nominally weighing 575 mg, were individually subjected to manipulation (e.g., comminuted) and the resulting samples individually extracted in vials containing 10 mL of simulated nasal fluid at 37°C with agitation on a platform shaker at 100 rpm. Aliquots were removed by syringe after 10 minutes and after 30 minutes, filtered, prepared for assay, and the concentration of hydrocodone or salt thereof in the filtrate determined by HPLC. The 10 mL volume of simulated nasal fluid was insufficient to allow an assayable volume to be obtained from the viscous slurry of the manipulated dosage form. It is expected that this physical property of the higher strength tablets will make them significantly more difficult to snort than the lower strengths. For the purposes of analysis, the 60 and 90 mg strength dosage form samples were subjected to manipulation (e.g., comminuted), and then 575 mg of each sample was transferred to 10 mL of simulated nasal fluid so that sufficient sample could be obtained for analysis. The remainder of the analysis was performed as previously described for the lower dosage form strengths. (Thus, for 60 and 90 mg strengths, extraction efficiencies must be multiplied by 575/1150 and then the dosage form's dose strength to determine the absolute mass of drug extracted.) In a nasal abuse scenario, abusers may insufflate the entire 1150 mg mass in one bout but could also elect to divide the powder if the mass is too great. The altered procedure mimics the latter. Simulated intravenous injection. A common approach described for IV abuse of opioid tablets is to crush a tablet and heat the powder in a small volume of water in a tablespoon for a short period of time over a flame, often using a cigarette lighter or similar heat source (Katz et al 2006). The material is then loaded into a syringe for injection, often in one of two ways. The extraction mixture can be drawn through filtering material (e.g., cotton swab or cigarette filter) and needle into a syringe and the contents then directly injected. Alternatively, the syringe plunger can be removed, a filter placed in the hub-end of the barrel, the extraction mixture poured directly into the syringe barrel, and plunger replaced. Extracts are then filtered as the plunger is depressed during injection. Two different sets of conditions were tested in order to assess release from the presently disclosed dosage forms. The first set included manipulation and extraction in water, the second set included extraction of intact and manipulated dosage forms in media of different pH. Experimental conditions were designed to mimic the small volume extraction operation in the controlled laboratory setting. Several extraction times were employed in both of the water studies and the pH buffer studies. Continuous heat was applied to the latter to maintain the extraction temperature for the longest extraction period, whereas the pre-heated water for the former was not continuously heated through the shorter extraction periods. Hydrocodone bitartrate drug substance (API) was employed as a control for each set of experimental conditions. A single-agent extended release hydrocodone bitartrate product, ZOHYDRO ER, became available in 2014. Thus, ZOHYDRO ER capsules were added to the pH buffer studies to serve as a comparator. Following extraction as described, the first assessment was whether drawing the mixture into a syringe through a needle or expelling the mixture from a syringe through a needle was feasible. These are termed syringeability and injectability, respectively. Needle sizes and extraction volumes were incrementally evaluated as needed to explore the range of the physical barriers and to achieve conditions where filtrates could be collected. The explorations started with extraction volume of 5 mL. To be deemed physically feasible, the operation must yield at least 1.5 mL of filterable extract solution for at least 4 of 6 replicates. If the Step 1 condition (no needle, 5 mL extraction volume) was found to be feasible, then needle gauges of 22 (Step 2) and 27 (Step 3) were successively evaluated. If the Step 1 condition (no needle, 5 mL extraction volume) was found to be not feasible, then the extraction volume was increased to 10 mL and the no needle/needle gauge evaluation was repeated. If the Step 4 condition (no needle, 10 mL extraction volume) was found to be feasible, then needle gauges of 22 (Step 5) and 27 (Step 6) were successively evaluated. If the Step 4 condition (no needle, 10 mL extraction volume) was found to be not feasible, then the samples were not syringeable and the experiments moved to Step 7 for injectability assessment. This occurred in only a few cases. The decision-making process also indicated which samples were then further analyzed by HPLC for drug content. The filtrates were analyzed for % drug released (i.e., % of drug extracted and available for injection) to determine the total amount of drug that could potentially be injected by an abuser. By design, the last extraction volume/needle configuration that was found to be feasible was the Step number that was employed for the HPLC analysis. Feasible samples of Steps 1-3 (5 mL extraction volume) are interpreted as samples with lower viscosity than feasible samples of Steps 4-8 (10 mL extraction volume). Feasible samples with 27 gauge needles (Step 3 and Step 6) are interpreted as samples with lower viscosity than feasible samples with 22 gauge needles (Step 2 and Step 5, respectively) or no needles (Step 1 and Step 4, respectively). Samples that are injectable (Steps 7 and 8) are physically more difficult to manipulate than syringeable samples (Steps 1-6). Simple Aqueous Extractions for Direct Ingestion. For direct oral ingestion of the solubilized extracts, the extraction solvent must be potable, so only aqueous and partially ethanolic solvents were considered for this category of extraction. Hydrocodone bitartrate, for example, is soluble at >90 mg/mL in aqueous solutions across the pH range of 2 to 8. Theoretically, this is sufficient solubility to extract all drug from each strength of extended release hydrocodone dosage form into as little as 1 mL of solution. Common household ingestible liquids such as vinegar, citrus juices, and soda fall within this pH range, as well as saliva and water. A 40% ethanol solution simulates use of a strong alcoholic beverage to extract drug for ingestion. The solubility of hydrocodone bitartrate in 40% ethanol is also high, -70 mg/mL. Hydrocodone bitartrate is poorly soluble in ingestible household oils such as olive oil. An unpalatable 220 mL of olive oil would be needed to solubilize 45 mg of drug for ingestion, making this an impractical extraction solvent. Based on this data, solutions spanning a pH range from 2-8 were selected for aqueous extraction experiments to represent the range of solutions that might be used for aqueous extractions, along with 20% and 40% ethanol. An extraction volume of 30 mL was selected to simulate an easily ingested "shot." As noted above, this volume is significantly greater than that needed to fully solubilize the drug in a 90 mg strength dosage form. Prior to extraction, dosage forms were comminuted using either one of two different tools. In 20% ethanol experiments, intact dosage forms were extracted, also. A range of extraction times, temperatures and agitation conditions were characterized. These cover a range from "passive" (ambient, no agitation) to "aggressive" extraction. After extraction, samples were assayed by HPLC for hydrocodone bitartrate. Simple (Single Solvent) Organic Extractions with Residues Isolated. An alternative approach to extracting manipulated dosage forms in ingestible household solutions is to extract the hydrocodone or salt thereof from comminuted dosage forms using a volatile solvent, which is subsequently removed by evaporation to yield an isolable residue. This residue could be directly insufflated or it could be reconstituted for ingestion or injection. A variety of advanced organic solvents is available for this purpose. The solubility of opioid salts in organic solvents generally decreases as the hydrophilicity of the solvent decreases, as illustrated by the extremely low solubility of hydrocodone bitartrate in hexane. Almost two liters of hexane would be required to solubilize 45 mg of drug, making it an impractical extraction solvent. Hydrocodone bitartrate solubility correlates with higher solvent polarity. The drug is somewhat soluble in other organic solvents, which may make them more feasible extraction solvents. One particular organic solvent in particular was selected based on easier household access. The remaining feasible solvents were selected for solvent extraction experiments. 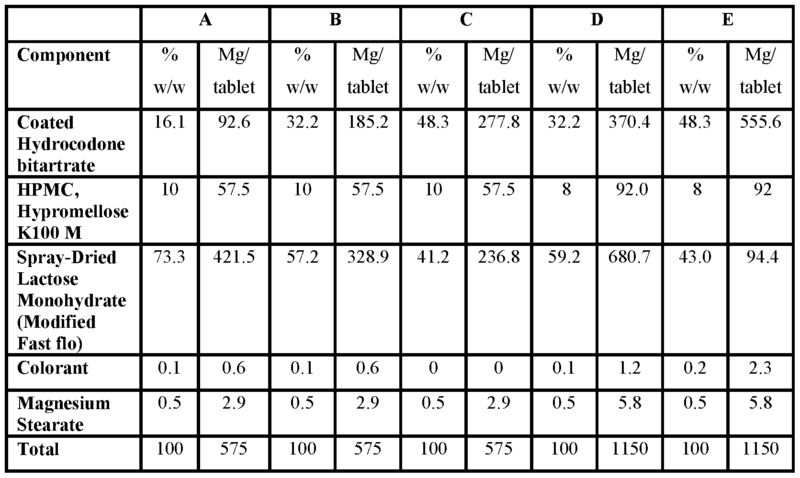 Because of the relatively low solubility of drug substance in the organic solvents, the extraction volume was increased proportionally with the tablet strength (e.g., 30 mL for 15 mg strength, 180 mL for 90 mg strength). The theoretical maximum concentration of hydrocodone bitartrate is therefore 0.5 mg/mL for each dose strength. This was done to ensure that any changes in extraction efficiency as a function of dose strength were not due to reaching a solubility limit as the total amount of drug increased. These solvents are relatively volatile, so removal of excess solvent is not considered a large barrier for abusers. Prior to extraction, dosage forms were comminuted using two manipulation methods. The extractions were performed at ambient temperature. The range of extraction times and agitation conditions were characterized to represent a range of manipulation techniques that might be employed. After extraction, samples were filtered, and the filtrate dried (blown air or nitrogen gas) to remove solvent prior to weighing and assay by HPLC. Multiple Step Liquid-Liquid Extractions . Multiple-step chemical extractions are complex and require specialized equipment. Drug abusers that carry out these manipulations are thought to represent a relatively small, sophisticated fraction of total abusers. The premise of these manipulations is to release the opioid from the excipients and then separate the opioid from the excipients using liquid/liquid extractions, yielding a relatively pure opioid that is more suitable for abuse by any route. The procedure for assessment employed extraction steps and organic solvents. Though the isolated material is in the free base form, the expression of the percentage drug recovered (extraction efficiency) is relative to the label claim of hydrocodone bitartrate in the dosage form before comminution. The purity, however, is expressed with the hydrocodone in its free base form. Dosage forms representative of the present invention (namely, VANTRELA ER tablets) and the comparators IR VICOPROFEN and ZOHYDRO ER were subjected to representative mechanical manipulation techniques. The resulting powders were subjected to simulated oral ingestion using an in vitro dissolution test in simulated gastric fluid with sampling from 15 minutes to 6 hours. Drug release from the manipulated formulations was determined using HPLC. manipulated ZOHYDRO ER dumped 97% of its hydrocodone dose within 30 minutes. By contrast, manipulated VANTRELA ER retained significant extended release characteristics. Additional tests involving simulated oral ingestion were performed on inventive dosage forms containing 15 mg of hydrocodone bitartrate. Among the tested dosage forms, the highest amount of drug release at 30 minutes was 68%, and the highest amount of drug release at 120 minutes was 81%. The effect of temperature extremes on VANTRELA ER tablets was investigated by pretreatment of tablets at chosen Temperatures 1, 2, and 3 before manipulation with Tool A. The simulated oral ingestion percent of drug released results at 30 and 120 minutes are presented in FIG. 2. The percent of drug released at 30 minutes for Temperature 1 and 2 was nearly identical, 20% and 22%, respectively. Pretreatment of VANTRELA ER tablets at Temperature 3 before manipulation with Tool A resulted in a slight change in release rate of hydrocodone early in the profile. The mean percent of drug released at 30 minutes increased to 29% after manipulation. Thus, neither of the temperature extremes was an effective means of defeating the ER nature of the presently disclosed dosage forms. Intranasal insufflation experiments included VICOPROFEN and ZOHYDRO ER comparators, and drug substance controls. Manipulation of each dosage form resulted in fine powder masses with particle size amenable for insufflation. (representative of other common tools evaluated). However, none of the manipulation tools resulted in immediate release of the drug from manipulated VANTRELA ER. The use of Tool E resulted in only 12% and 17% drug released after 10 and 30 minutes, respectively. The corresponding percent of drug released values when Tool A was used for manipulation were 1% and 4%. In contrast, manipulated ZOHYDRO ER resulted in 89% of drug released in the first 10 minutes of extraction, with no extended drug release observed. Additional tests involving simulated intranasal insufflation were performed on inventive dosage forms containing 15 mg of hydrocodone bitartrate. Among the tested dosage forms, the highest amount of drug release at 10 minutes was 38%, and the highest amount of drug release at 30 minutes was 46%. The effect of temperature extremes on VANTRELA ER was investigated by pretreatment of tablets at Temperatures 1, 2, and 3 before manipulation. Temperatures 1 and 2 prior to manipulation with Tool A and simulated nasal fluid extraction resulted in similar percent drug released. Temperature 3 before manipulation with Tool A had a minor effect. The percent drug released for Temperature 3 was slightly higher than that of tablets pre-treated at the other temperatures. These findings were consistent with trends observed in the simulated oral ingestion experiments (Example 3). While the subjective effects of the gel -forming polymers in the nose after insufflation and the practicality of insufflating up to 1150 mg of material cannot be assessed with in vitro studies, VANTRELA ER clearly resisted extraction of hydrocodone in biologically- relevant volumes of simulated nasal fluid when compared to ZOHYDRO ER. Because extraction of hydrocodone from the dosage form into nasal fluid is necessary for mucosal absorption, the resistance of the formulation to releasing hydrocodone bitartrate under these conditions suggested the intranasal route may not be a preferred route of abuse for VANTRELA ER because the proportion of the drug dissolved and available for intranasal absorption is expected to be minimal. When the presently disclosed dosage forms were manipulated with various tools and mixed with small volumes of extraction medium, the resulting visually heterogeneous mixtures contained flocculent undissolved particulates, gelled polymer, and colorants. Extracts were often difficult to filter and syringe. The ease of manipulation varied. In Liquid a, Agitation Method X and longer extraction time led more frequently to the need for larger extraction volumes, indicating that the viscosity of the samples had increased. Simulated intravenous manipulation - percentage of drug recovered. The percent of drug recovered represents the maximum quantity of hydrocodone that could be obtained for injection from each tablet manipulated and extracted under the experimental conditions, relative to the tablet dose. however, this was due to a decrease in the volume of syringeable solution obtained. The concentration of drug remained constant from 1 minute through a longer extraction time, indicating complete extraction. Thus, these VANTRELA ER tablets represent a much more difficult dosage form to manipulate and extract for IV abuse than ZOHYDRO ER. Additional tests involving manipulation and extraction were performed on inventive dosage forms containing 15 mg of hydrocodone bitartrate. Among the tested dosage forms, the highest amount of drug release following manipulation using Tool E and 1 minute in a weakly acidic medium was 47%, and the highest amount of drug release following manipulation using Tool E and 5 minutes in a pH neutral medium was 34%. Other experimental parameters were not as strongly correlated to simulated IV extraction efficiencies. Simulated IV extraction with Agitation Method Z yielded similar percent of drug recovered results as those in FIG. 4. Pretreatment of tablets at Temperatures 1, 2, and 3 prior to manipulation and simulated IV extraction also showed little difference in percent of drug recovered. Additional experiments were performed to evaluate other aspects of extraction for IV abuse. Extraction of intact VANTRELA ER tablets in simulated IV media resulted in lower percent of drug recovered than from manipulated tablets. Extraction experiments of manipulated VANTRELA ER tablets extended to a longer extraction period showed that the percent of drug recovered steadily increased over time; however, the majority of the dose remained unavailable. When the broadly representative tool (Tool A) was used for manipulation, the percent of drug recovered was <33% after a longer extraction period; when the most effective tool (Tool E) was used the percent of drug recovered was <41%. The pH of the extraction medium did not adversely affect the percent of drug recovered. The gel-forming excipients rendered small volume extraction mixtures visually unappealing and increased the difficulty of filtering and syringing samples from manipulated VANTRELA ER tablets for IV injection. These features may by themselves deter IV drug abuse. The aliquots obtained using short (<5 minutes) extraction times contained relatively little hydrocodone, demonstrating that the inventive dosage forms resisted release of hydrocodone into the small volumes required for injection. Somewhat higher hydrocodone content was obtained from extended extraction times, but the formulation still did not release the majority of the drug. In contrast, complete extraction of hydrocodone from manipulated ZOHYDRO ER was achieved within 1 minute. Small volume extracts from intact VANTRELA ER tablets were not as difficult to filter and syringe as manipulated tablets, but the amount of drug recovered was lower. For drug abusers that are not deterred by the difficult manipulation and physical properties of VANTRELA ER tablets, the limited hydrocodone in an extract may be insufficient to reinforce repeat IV abuse. Chemical extractions fall into two categories, extractions in ingestible liquids and extractions using organic solvents. Extractions in ingestible liquids aim to liberate the opioid from the ER mechanism of the formulation for oral ingestion; while extractions using organic solvents aim to separate the opioid to some extent from the tablet excipients resulting in a solid residue suitable for abuse. Both types of studies were conducted. Extraction conditions ranged from simple to complex, exploring effects of manipulation tool, agitation, solvent type, temperature, and complexity of procedures. a. Simple Aqueous Extractions For Direct Ingestion. temperatures, and agitation conditions were characterized. Manipulated and intact ZOHYDRO ER were included as comparators. The percent of drug recovered from manipulated VANTRELA ER tablets extracted into five separate solvents intended for ingestion generally increased as temperature, agitation, and extraction time increased. The percent of drug recovered was generally higher with use of Tool E relative to Tool A. Representative percent of drug recovered for dosage forms manipulated with Tool A are shown in FIG. 5. At Temperature 7 and Agitation Method Z, only 8%-10% of the drug was extracted from manipulated VANTRELA ER after a first time period. In contrast, >78% of drug was extracted from manipulated ZOHYDRO ER after the first time period. Over an extended extraction time, 32%-34% of drug was extracted from VANTRELA ER, indicating retention of ER characteristics. When Agitation Method W was applied to manipulated dosage forms at Temperature 7 in four different solvents, the percent of drug recovered increased, as shown in FIG. 6. However, manipulated VANTRELA ER retained its ER properties, with the percent of drug recovered remaining below 30% following the first time period in 3 of the 4 solvents. Higher drug recovery was seen for Solvent h under these conditions: 62% following the first time period. In contrast, manipulated ZOHYDRO ER showed an immediate drug release profile in each solvent with >95% of drug recovered within the first time period. Extractions generally increased with time. VANTRELA ER. The most effective tool (Tool E) resulted in somewhat higher drug extraction. The percent of drug recovered after the first time period (corresponding to the data in FIGS. 5 and 6) ranged from 24%-31% and 39%-67%, respectively, for Tool A. The pH of ingestible solvents did not affect the percent of drug recovered from manipulated VANTRELA ER. Additional tests involving use of a tool and chemical extraction were performed on inventive dosage forms containing 15 mg or 60 mg of hydrocodone bitartrate. Among the tested dosage forms, the highest amount of drug release following manipulation using Tool E and 30 minutes in an organic solvent-based extraction medium was 57% for a 15 mg dosage form, and the highest amount of drug release following manipulation using Tool E and 120 minutes in an organic solvent-based extraction medium was 65% for 60 mg dosage form. b. Advanced Solvent Extractions with Residues Isolated. Five advanced solvents were identified with hydrocodone bitartrate solubility sufficient to be used for extraction experiments with isolation of drug residue: Solvents m, 1, i, j, and n. Prior to extraction, tablets were manipulated using either Tool A or Tool E. The extractions were performed at Temperature 7, with Agitation Method W or Z, from a first time point to a second time point. Samples were filtered and the solvent removed to isolate solid material. The percent of drug recovered and the purity of the isolated residues were determined. ZOHYDRO ER manipulated with Tool A was included as a comparator. Recovery of >80% of the drug was generally achieved within the period of time prior to the first time point for VANTRELA ER, relative to the solubility limit of hydrocodone in the respective solvent. However, the purity of drug substance extracted from manipulated VANTRELA ER tablets was very low. The percent of drug recovered from manipulated ZOHYDRO ER was generally >90% within the period of time prior to the first time point. The residues isolated from manipulated ZOHYDRO ER extracts, however, exhibited higher purity than those from manipulated VANTRELA ER tablets. Purity data from extractions within the first time point in the five solvents with Agitation Method W are summarized in FIG. 7, along with corresponding data from manipulated ZOHYDRO ER. Mean purities ranged from 3% to 18% weight/weight (w/w) for VANTRELA ER tablets. The very low purities for the residues extracted from VANTRELA ER tablets were likely due to significant amounts of other components that are relatively soluble in the advanced solvents. The presence of the other components also likely prevents complete removal of the solvent during the drying process. 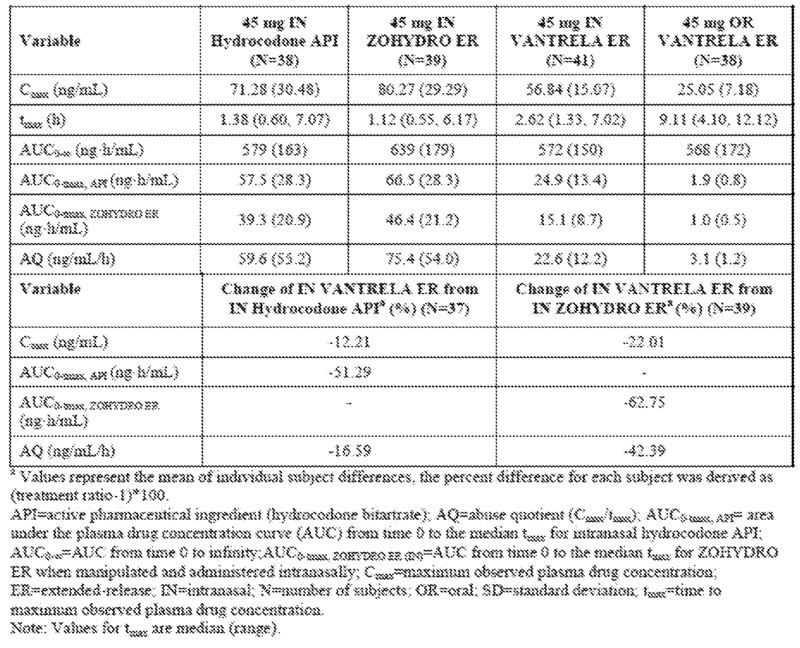 Residues isolated from manipulated ZOHYDRO ER extractions in Liquid i, n, 1, and j possessed purities ranging from 62% to 94%; whereas, purities were <18% for drug isolated from inventive dosage forms in these solvents. Thus, even though extraction efficiencies were high for both drug products, the present dosage forms are favorable for advanced solvent extractions due to the lower purity of the isolated hydrocodone. c. Multiple-Step Chemical Extractions with Residues Isolated. To investigate procedures that sophisticated abusers with some knowledge of chemistry and laboratory equipment might employ, a set of multiple-step extraction studies was performed using both aqueous and organic solvents. The objective was to separate the drug from the excipients using liquid/liquid extractions and to isolate relatively pure drug suitable for abuse by any route. Three advanced organic solvents were evaluated and manipulation was accomplished using Tool A and Tool E. At the end of the multiple-step procedure, the drug was isolated by evaporation of the advanced solvent and its mass and purity were determined. The percent of drug recovered and the purity of drug recovered are shown in FIG. 8. VANTRELA ER tablets were lower than those from manipulated ZOHYDRO ER. Some experimental variability was noted in this battery of experiments. Despite considerable effort, separation of the layers was difficult due to the polymeric tablet excipients, which may have led to variable loss of drug from replicate to replicate and variation in the purities obtained. The degree of effort required to optimize the liquid/liquid extraction process could deter all but the most sophisticated abusers. A first study was designed to evaluate the pharmacokinetic profile of manipulated dosage forms according to the present disclosure following oral ingestion, as well as bioavailability relative to VICOPROFEN. The pharmacokinetics of hydrocodone following oral administration of a single 15-mg VANTRELA ER tablet (intact and manipulated using a Tool F) were compared to the pharmacokinetics of hydrocodone following oral administration of a 15- mg dose of an IR hydrocodone combination product VICOPROFEN, administered as two 7.5- mg hydrocodone/200-mg ibuprofen tablets (intact and manipulated using Tool F), in an open- label, 4-period crossover study in healthy naltrexone-blocked subjects in the fasted state. approximately 65% lower than for the intact IR comparator. Following administration of manipulated VANTRELA ER, tmax occurred earlier than following administration of VANTRELA ER intact (2.5 vs. 7.0 hours, respectively) but was later than with the IR product (1.8 hours). 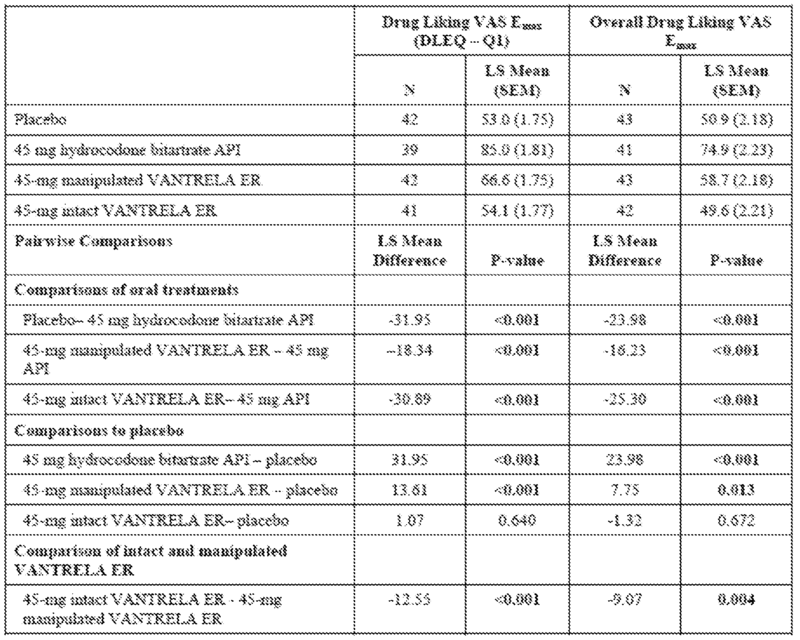 The differences in peak and time to peak resulted in notably different AQ for the intact VANTRELA ER tablet (AQ=1.8), as compared with the manipulated VANTRELA ER tablet. A notable difference in this respect was also observed between manipulated VANTRELA ER tablet and intact VICOPROFEN tablet. VANTRELA ER tablet, in a randomized, double-blind, crossover study in fasted healthy non- dependent recreational opioid users. manipulated). Mean Cmaxwas highest following administration of hydrocodone API (FIG. 10 and Table 2, below). Manipulated VANTRELA ER was associated with an approximately 55% lower Cmax compared to hydrocodone bitartrate API, and was lowest following administration of intact VANTRELA ER. administration of hydrocodone bitartrate API, indicating that VANTRELA ER retains some of its ER properties following manipulation. A first study was conducted in order to evaluate the pharmacokinetics of manipulated dosage forms according to the present disclosure following intranasal insufflation. 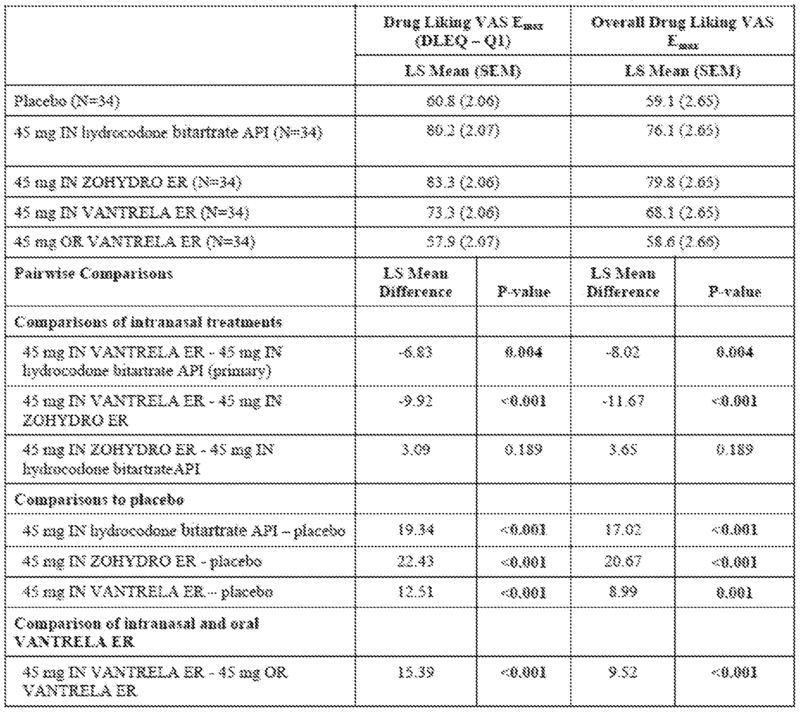 The pharmacokinetics of hydrocodone were compared following intranasal insufflation of a manipulated 45-mg VANTRELA ER tablet, hydrocodone bitartrate API, and a manipulated single-entity ER hydrocodone product (ZOHYDRO ER) in a double-blind, randomized crossover study in recreational drug abusers with a history of opioid insufflation, in the fasted state. The study included also an intact oral VANTRELA ER test. administration of oral intact VANTRELA ER. Although shorter than that for oral intact VANTRELA ER, the median tmax for intranasal VANTRELA ER was delayed compared with that observed following administration of both hydrocodone bitartrate API and intranasal ZOHYDRO ER, indicating that VANTRELA ER retains some of its ER properties after being manipulated and insufflated. Comparison of early exposure, as measured by AUCo-tmax for the different treatments, showed findings consistent with peak exposure. Early exposure was highest with intranasal ZOHYDRO ER. Intranasal VANTRELA ER was associated with approximately 51% lower early exposure compared to intranasal hydrocodone API, as assessed by AUCo-tmax, API (IN). VANTRELA ER (AQ=22.6), and oral intact VANTRELA ER (AQ=3.1). The effect of alcohol on the pharmacokinetics of hydrocodone following oral administration of the intact dosage forms according to the present disclosure was assessed in a randomized, open-label crossover study in healthy naltrexone-blocked subjects. Treatments included 15 mg VANTRELA ER dosed in the fasted state with each of the following: 240 mL of water, 240 mL of 4% volume/volume (v/v) ethanol, 240 mL of 20% v/v ethanol, and 240 mL of 40% (v/v) ethanol. 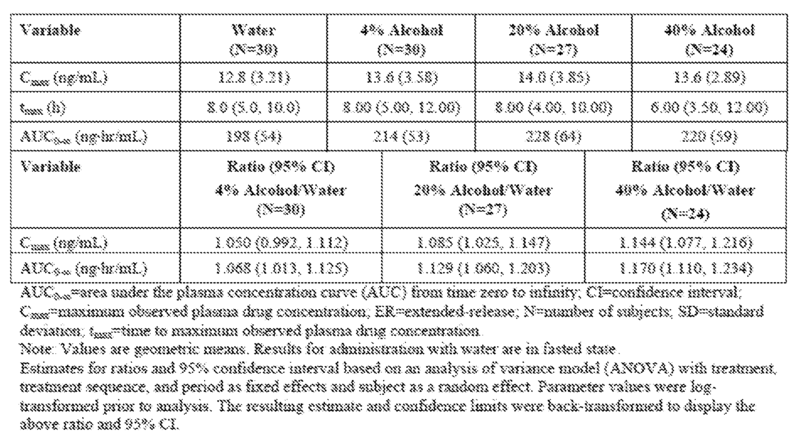 Hydrocodone mean peak and overall systemic exposure (Cmax and AUCo-∞) was comparable when VANTRELA ER tablets were administered with alcohol compared with water (FIG. 12 and Table 4), meeting criteria for bioequivalence. No dose-dumping was observed in the presence of alcohol, with a similar median tmax of approximately 6 to 8 hours for all treatments. Results of this study indicate that patients who ingest alcohol in temporal proximity to the present dosage forms for the treatment of pain will not be in danger of overdose. It should be noted, however, that taking the presently disclosed dosage forms with alcohol should be avoided because combining any amount of hydrocodone with alcohol may result in or exacerbate the adverse effects of hydrocodone, particularly those involving the central nervous system (CNS). Two studies were conducted to evaluate the relative abuse potential of the inventive dosage forms in nondependent recreational opioid abusers. A first study assessed abuse potential following oral administration of a manipulated VANTRELA ER tablet as compared to hydrocodone bitartrate API, intact VANTRELA ER, and placebo. A second study assessed abuse potential following intranasal administration of a manipulated VANTRELA ER tablet as compared to hydrocodone bitartrate API, a manipulated commercially available single-entity ER hydrocodone bitartrate product (ZOHYDRO ER), and placebo. Pharmacokinetic data collected in those studies were described above in Examples 7 and 8. Both studies were randomized, double-blind, placebo-controlled, single-dose, crossover studies. The study population consisted of subjects aged 18 to 52 years who were non- dependent recreational drug abusers. The studies began with a Qualification Phase in which subjects demonstrated the ability to both tolerate the planned dose of opioid to be tested and to differentiate between the opioid and placebo through the intended route of administration. Subjects who successfully passed the Qualification Phase entered the Treatment Phase where the relative abuse potential of the different treatments were assessed. Study 1: Abuse Potential of Manipulated Dosage Form Administered Orally. This designed to assess the abuse potential of orally administered manipulated and intact 45-mg VANTRELA ER compared to 45 mg hydrocodone bitartrate API, and placebo. The overall study design was generally consistent with regulatory and other guidelines for human abuse potential studies available at the time of the study (Chen and Tsong 2007, FDA 2010, Griffiths et al 2003). At the time this study was conducted, there were no marketed single-entity ER hydrocodone products available. Therefore, it was not possible to include an ER reference product. In addition, available hydrocodone IR products in the U.S. contain other active ingredients (e.g., acetaminophen) which would have presented additional safety concerns with the high hydrocodone dose administered. As per the FDA draft guidance available at the time, the positive comparator in an abuse potential study of an ER opioid formulation with potential abuse-deterrent properties could be an IR formulation of the same opioid (FDA 2013). Therefore, hydrocodone bitartrate API powder was selected as an IR comparator. The VANTRELA ER tablet and matching placebo were manipulated using Tool F. Specific considerations in selection of this method were the simulated oral ingestion dissolution profile and feasibility of the manipulation method in a clinical trial setting (including material loss and staff exposure). Pupillometry was also assessed as an objective measure of drug effect. hydrocodone bitartrate API vs. oral manipulated VANTRELA ER. Continuous and ordinal categorical pharmacodynamic parameters were analyzed using a mixed effects analysis of variance (ANOVA) model that included study drug, treatment sequence, and period as fixed effects, and subject as a random effect. Comparisons between pairs of treatments were made using the least square means that were estimated from the ANOVA. Post-hoc analysis was also conducted using non-parametric analysis. A responder analysis was performed post-hoc using percent reduction using the Drug Liking VAS Emax. In this analysis, various deciles (e.g., 30%, 40%, 50%, etc.) were used and a binomial proportion test was used to test the null hypothesis that 50% or fewer subjects were responders at each decile. Mean scores over time on the primary Drug Liking VAS measure (DLEQ question 1) following administration of placebo, VANTRELA ER (manipulated and intact), and IR hydrocodone bitartrate API are presented in FIG. 13. (approximately 10 points). Drug Liking VAS scores following administration of placebo and intact VANTRELA ER had very similar profiles, showing little change over time and hovering around the neutral mark (50). VAS=visual analog scale. P-values were based on mixed model with treatment, study period, and sequence as fixed effects, and subject as a random effect. P-values are based on a mixed model that includes study drug, treatment sequence, and period as fixed effects, and subject as a random effect. There were statistically significant differences between placebo and hydrocodone bitartrate API for Drug Liking VAS Emax (DLEQ Question 1), thereby confirming study validity. Consistent with the results of the primary endpoint, hydrocodone bitartrate API showed statistically significant differences from placebo on the secondary measures of balance, positive effects, negative effects, other effects, and pupillometry. Oral intact and oral manipulated VANTRELA ER treatments were associated with significantly lower effects compared to hydrocodone bitartrate API on the primary endpoint, Drug Liking VAS, and most secondary subjective and pupillometry endpoints. In addition, VANTRELA ER(both intact and manipulated) showed a delayed onset relative to hydrocodone bitartrate API. The differences were most pronounced with the intact tablet. The results of a post hoc responder analysis demonstrated that for the maximum effect of "at the moment" drug liking, 94% of subjects showed >30% reductions with intact VANTRELA ER compared with hydrocodone bitartrate API, while 88% of subjects showed >50% reduction. When manipulated VANTRELA ER was compared to hydrocodone bitartrate API, approximately 67% of subjects showed greater than a 30% reduction in Emax and 58% of subjects showed greater than 50% reduction in Emax (FIG. 14). Oral intact VANTRELA ER showed minimal differences relative to placebo, with no statistically significant differences on the primary endpoint of Drug Liking VAS Emax or on the Overall Drug Liking VAS. Manipulated VANTRELA ER was associated with significantly greater liking at this moment and overall liking compared to placebo (Drug Liking VAS Emax and Overall Drug Liking 24-hour score). Post-hoc analysis of the primary endpoints using a non-parametric model (Wilcoxon Signed Rank Test) revealed a similar pattem of results. Study 2: Abuse Potential of Manipulated Dosage Form Administered Intranasally. This was a randomized, double-blind, quadruple-dummy, active- and placebo- controlled crossover study designed to assess the abuse potential of manipulated dosage forms according to the present disclosure, administered intranasally to healthy, nondependent recreational opioid users. The overall design was consistent with draft FDA guidelines for abuse potential assessment of abuse-deterrent opioid formulations in humans available at the time the study was conducted (FDA 2013) and conducted based upon FDA feedback. The intranasal route was assessed in this study as epidemiological data show that this is a prevalent route of administration for opioid abusers (Hays et al 2003 and Osgood et al 2012). This study was performed in self-reported nondependent recreational opioid users with recent (within 3 months) intranasal insufflation experience. These subjects provided the most relevant and sensitive population for an abuse potential study and were considered better able to tolerate the intranasal ROA. In addition to being history-qualified, the pre-study qualification ensured that the subjects were able to tolerate the intranasal ROA, the dose of hydrocodone, and differentiate between hydrocodone and placebo, as well as report positive subjective effects of the drug in a controlled laboratory setting. Comparator Selection. In a study of an ADF, the comparator is typically an IR or controlled-release formulation of the same active substance. Because IR hydrocodone is primarily available as low- dose combination products with acetaminophen or other active ingredients, hydrocodone bitartrate API was used as the primary active control. Another ER hydrocodone bitartrate product (ZOHYDRO ER), which became commercially available just prior to the start of the study, was also used as a comparator. An oral intact VANTRELA ER arm was included to provide a reference relative to the intended therapeutic oral route. 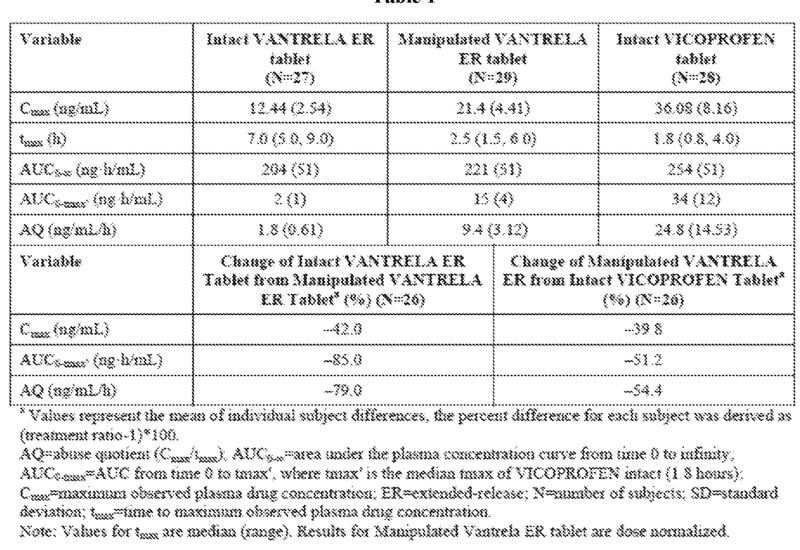 The VANTRELA ER tablet, ZOHYDRO ER, and matching placebo were manipulated using Tool C based on results of in vitro physical manipulation and extraction studies. Unlike for the method used in the studies in which the manipulated product was orally ingested, particle size distribution was a primary consideration for the intranasal liking study. Tool C produced materials of the smallest particle size, most appropriate for insufflation. Other considerations in selection of this method were simulated oral ingestion and simulated nasal insufflation dissolution profiles and feasibility of the manipulation method in a clinical trial setting (including material loss and staff exposure). Pharmacodynamic Measures and Analysis . The primary pharmacodynamic endpoints for assessment of relative abuse potential in Phase C of the study were the Emax of the Drug Liking VAS (question 1 of the DLEQ) and Emax of the Overall Drug Liking VAS. [SRAII], Ease of Snorting VAS), sedative effects (ARCI PCAG, Alertness/Drowsiness VAS (DLEQ question 2), and other effects (Any Effects VAS - DLEQ question 6 - and pupillometry). With the exception of the intranasal scales, the measures were the same as those used in Study 1, above. Pharmacodynamic endpoints for Phase C (Emax, minimum effect [Emin], and/or AUEC, as appropriate) were analyzed using a mixed effect model for a crossover study (unless non-parametric testing was required). intranasal manipulated VANTRELA ER vs. placebo; intranasal manipulated ZOHYDRO ER vs. placebo; intranasal manipulated VANTRELA ER vs. intranasal manipulated ZOHYDRO ER; and, intranasal manipulated ZOHYDRO ER vs. hydrocodone bitartrate API. In addition to the primary statistical analysis, a "responder" analysis was conducted according to the draft guidance, on abuse-deterrent opioids evaluation and labeling" (FDA 2013) to determine the proportion of subjects who achieved a pre-specified level of reduction in Emax of the primary endpoints for VANTRELA ER relative to hydrocodone bitartrate API (and ZOHYDRO ER). Mean Drug Liking VAS (question 1 of the DLEQ) scores over time for each treatment are presented in FIG. 15. Mean Drug Liking VAS scores following administration of intranasal hydrocodone bitartrate API and intranasal ZOHYDRO ER increased rapidly, with a steep rate of rise and an onset of effects beginning at approximately 0.5 hours post-dose. In contrast, intranasal VANTRELA ER administration was associated with a slower rise in Drug Liking VAS scores to a lower peak effect. Mean scores were above 65 for a shorter period of time, later in the time-course profile (from 2 to 3 hours post-dose) compared with intranasal hydrocodone bitartrate API and intranasal ZOHYDRO ER. Drug Liking VAS scores over time were comparable following administration of oral intact VANTRELA ER and placebo. Both showed little increase above the neutral point of the scale (mean scores up to 55.5 with placebo and up to 53.4 with oral intact VANTRELA ER). Table 6 presents a summary of analysis results for the 2 primary endpoints (Emax of Drug Liking VAS and Overall Drug Liking VAS). 1) and Overall Drug Liking VAS Emax, as well as the secondary measures of balance, positive effects, sedative effects, any effects, and pupillometry. Intranasal hydrocodone bitartrate API was also associated with statistically significant negative effects in comparison to placebo. ZOHYDRO ER was associated with similar or greater effects on the primary and secondary pharmacodynamic endpoints compared to intranasal hydrocodone bitartrate API. Intranasal VANTRELA ER also showed a slower onset of effects compared to intranasal hydrocodone bitartrate API and intranasal ZOHYDRO ER. 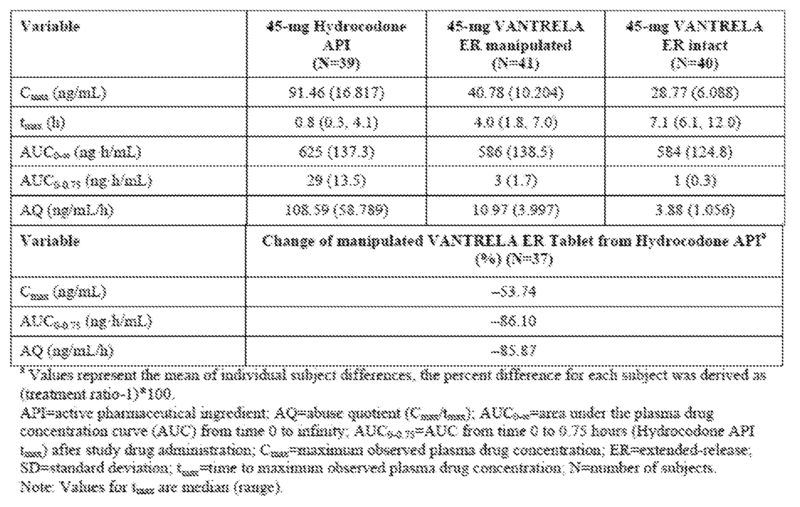 VANTRELA ER compared to intranasal hydrocodone bitartrate API (FIG. 17). A larger proportion of subjects showed reductions at the >30% and >50% deciles with intranasal VANTRELA ER compared to intranasal ZOHYDRO ER (38.2% and 23.5% for Drug Liking VAS and 48.5% and 30.3% for Overall Drug Liking VAS. All active intranasal treatments were associated with significantly greater effects in comparison to placebo on the primary and most secondary endpoints, while oral intact VANTRELA ER showed subjective effects similar to placebo. Consistent with the similarity between oral intact VANTRELA ER and placebo, statistical comparisons of intranasal manipulated VANTRELA ER and oral intact VANTRELA ER showed significant differences on most endpoints. Effects on the SRAII scales (intranasal effects) were modest; most scores for all treatments were in the range of 0 (Not observed/No problem) to 2 (Mild/Slight Problem). On the Ease of Snorting VAS, there was only 1 statistically significant difference in the pairwise comparisons: between oral intact VANTRELA ER treatment (the intranasal "dummy" treatment, essentially a 2.4: 1 ratio of sugar spheres:lactose placebo) and intranasal VANTRELA ER (mean difference 12.58; p=0.017). administration of intranasal ZOHYDRO ER, similar between intranasal hydrocodone API and intranasal VANTRELA ER, and lowest following administration of placebo and oral intact VANTRELA ER. All adverse events were mild or moderate in severity. No deaths, other serious adverse events, or severe adverse events occurred in this study. One subject was withdrawn from the study due to adverse events (nausea and vomiting) that interfered with intranasal hydrocodone API administration; however, this was based on the sponsor's decision due to incomplete drug administration, rather than the adverse events. Four adverse events related to the nose (all mild) were observed in one patient each: nasal discomfort, epistaxis, rhinalgia, and rhinorrhea after administration of intranasal placebo, intranasal hydrocodone API, intranasal ZOHYDRO ER, and intranasal VANTRELA ER, respectively. Abreu M E, Bigelow G E, Fleisher L, Walsh S L. Effect of intravenous injection speed on responses to cocaine and hydromorphone in humans. Psychopharmacology 2001 ;154:76-84. Agrawal Y, Platz EA, Niparko JK. Prevalence of hearing loss and differences by demographic characteristics among US adults: data from the National Health and Nutrition Examination Survey, 1999-2004. Arch Intern Med 2008; 168(14): 1522-30. Argoff CE and Kopecky EA. Patients with chronic pain and dysphagia (CPD): unmet medical needs and pharmacologic treatment options. Current Medical Research and Opinion 2014;30(12):2543-59. Butler SF, Cassidy TA, Chilcoat H, Black RA, Landau C, Budman SH, et al. Abuse rates and routes of administration of reformulated extended-release oxycodone: initial findings from a sentinel surveillance sample of individuals assessed for substance abuse treatment. J Pain. Califf RM, Woodcock J, Ostroff S. A Proactive Response to Prescription Opioid Abuse. N Engl J Med 2016;374(15): 1480-5.
www.cdc.gov/HomeandRecreationalSafety/pdf/Policylmpact-PrescriptionPainkillerOD.pdf. Accessed on 24 March 2014. Centers for Disease Control and Prevention, National Center for Injury Prevention and Control. Vital Signs: Overdoses of Prescription Opioid Pain Relievers—United States, 1999- 2008.
www.cdc.gov/mmwr/pdf/wk/mm6043.pdf. Accessed on 24 March 2014. Chen L and Tsong Y. Design and analysis for drug abuse potential studies: issues and strategies for implementing a crossover design. Therapeutic Innovation & Regulatory Science 2007;41(4):481-9. Cicero TJ, Ellis MS. Abuse-deterrent formulations and the prescription opioid abuse epidemic in the United States: lessons learned from OxyContin. JAMA Psychiat 2015;72:424- 30. Comer SD, Ashworth JB, Sullivan MA, Vosburg SK, Saccone PA, Foltin RW. Relationship between rate of infusion and reinforcing strength of oxycodone in humans. J Opioid Management 2009;5(4):203-12. Cone EJ, Darwin WD, Gorodetzky CW, Tan T. Comparative metabolism of hydrocodone in man, rat, guinea pig, rabbit, and dog. Drug Metab Dispos 1978;6(4):488-93. Coplan PM, Kale H, Sandstrom L, Landau C, Chilcoat HD. Changes in oxycodone and heroin exposures in the National Poison Data System after introduction of extended-release oxycodone with abuse-deterrent characteristics. Pharmacoepidemiol Drug Saf. 2013;22: 1274-82. de Wit H, Bodker B, Ambre J. Rate of increase of plasma drug level influences subjective responses in humans. Psychopharmacology 1992;107:352-58.
de Wit H, Didish S, Ambre J. Subjective and behavioral effects of diazepam depend on its rate of onset. Psychopharmacology 1993;112:324-30.
www.webmd.com/news/20110420/the-10-most-prescribed-drugs. Accessed on 24 March 2014. Guidance for Industry: Abuse-Deterrent Opioids— Evaluation and Labeling. Publication Date: January 2013. Guidance for Industry: General Principles for Evaluating the Abuse Deterrence of Generic Solid Oral Opioid Drug Products. Publication Date: 2016. Food and Drug Administration. Center for Drug Evaluation and Research. Guidance for Industry: Abuse-Deterrent Opioids— Evaluation and Labeling. Publication Date: 2015. Food and Drug Administration. Center for Drug Evaluation and Research. Guidance for Industry: Assessment of Abuse Potential of Drugs. Publication Date: January 2010. Food and Drug Administration Opioid Letter to Prescribers. "Labeling Supplement and PMR Required" 2013. Griffiths RR, Bigelow GE, Ator NA. Principles of initial experimental drug abuse liability assessment in humans. Drug Alcohol Depend 2003;70(3):S42-54. Havens JR, Leukefeld CG, DeVeaugh-Geiss AM, Coplan P, Chilcoat HD. The impact of a reformulation of extended-release oxycodone designed to deter abuse in a sample of prescription opioid abusers. Drug Alcohol Depend 2014;139:9-17. Hays L, Kirsh KL, Passik SD. Seeking drug treatment for OxyContin abuse: a chart review of consecutive admissions to a substance abuse treatment facility in Kentucky. J Natl Comprehensive Cancer Network 2003;l(3):423-8. The American Academy of Pain Medicine. AAPM Facts and Figures on Pain. Retrieved from http://www.painmed.Org/patientcenter/facts_on_pain.aspx#refer. Accessed 14 April 2016. Prescription Opioids: Nature and Extent of the Problem, Health Consequences, and Solutions. Amer J Drug Alcohol Abuse 2011;37(4):205-17. Lourenco LM, Mathews M, Jamison RN. Abuse-deterrent and tamper-resistant opioids: how valuable are novel formulations in thwarting non-medical use? Expert Opin Drug Deliv 2013;10(2):229-40. Manchikanti L, Helm S 2nd, Fellows B, Janata JW, Pampati V, Grider JS, et al. Opioid epidemic in the United States. Pain Physician 2012;15(3 Suppl):ES9-38. McNaughton EC, Coplan PM, Black RA, Weber SE, Chilcoat HD, Butler SF. Monitoring of Internet Forums to Evaluate Reactions to the Introduction of Reformulated OxyContin to Deter Abuse. J Med Internet Res 2014;16(5):el 19. Moore RA, Deny S, Wiffen PJ. Challenges in design and interpretation of chronic pain trials. Br.J.Anaesth 2013;l l l(l):38-45. Osgood E, Eaton TA, Trudeau JJ, Katz NP. A brief survey to characterize oxycodone abuse patterns in adolescents enrolled in two substance abuse recovery high schools. Am J Drug & Alcohol Abuse 2012;38(2): 166-70. Psychopharmacol. 2013;27:808-16. Substance Abuse and Mental Health Services Administration, Center for Behavioral Health Statistics and Quality. The DAWN Report: Highlights of the 2010 Drug Abuse Warning Network (DAWN) Findings on Drug-Related Emergency Department Visits. Rockville, MD, July 2012. Trescot AM, Helm S, Hansen H, Benyamin R, Glaser SE, Adlaka R, et al. Opioids in the management of chronic non-cancer pain: an update of American Society of the Interventional Pain Physicians' (ASIPP) Guidelines. Pain Physician 2008;11(2 Suppl):S5-S62. Turk DC, O'Connor AB, Dworkin RH, Chaudhry A, Katz NP, Adams EH, et al. IMMPACT recommendations. Pain 2012;10: 1997-2008.
the dosage form demonstrates resistance against attempted liberation of the hydrocodone or salt thereof from said dosage form by ingestion with alcohol by a subject. 2. The dosage form according to claim 1, wherein at least one property of the dosage form is that it demonstrates resistance against attempted liberation of the hydrocodone or salt thereof from said dosage form by in vitro manipulation, attempted isolation of the hydrocodone or salt thereof from said dosage form by chemical extraction, or both, prior to oral ingestion, intranasal insufflation, or intravenous injection. 3. The dosage form according to claim 1, wherein at least one property of the dosage form is that it demonstrates resistance to pharmacokinetic changes, pharmacodynamic changes, or both, in response to attempted liberation of the hydrocodone or salt thereof from said dosage form by in vitro manipulation, attempted isolation of the hydrocodone or salt thereof from said dosage form by chemical extraction, or both, prior to oral ingestion, intranasal insufflation, or intravenous injection, as compared with the same dosage form that is not subjected to the in vitro manipulation or chemical extraction prior to oral ingestion. 4. The dosage form according to claim 1, wherein at least one property of the dosage form is that in vitro manipulation of the dosage form, followed by extraction of the hydrocodone or salt thereof from the manipulated dosage form, provides extracted hydrocodone or salt thereof having a purity that reflects incomplete isolation of the hydrocodone or salt thereof from one or more other components of the dosage form. 5. The dosage form according to claim 1, wherein at least one property of the dosage form is that it demonstrates resistance against attempted liberation of the hydrocodone or salt thereof from said dosage form by ingestion with alcohol by a subject. 6. The dosage form according to any of claims 1 to 4, wherein the in vitro manipulation includes subjecting the dosage form to milling, cutting, grinding, crushing, or any combination thereof. 7. The dosage form according to claim 6, wherein the in vitro manipulation or chemical extraction has a duration of up to 30 minutes. 8. The dosage form according to claim 6, wherein the in vitro manipulation or chemical extraction has a duration of about 30 minutes to about 60 minutes. 9. The dosage form according to claim 2, wherein the demonstrated resistance to the in vitro manipulation includes releasing less than 50% by weight of the hydrocodone or salt thereof during a period of up to 30 minutes following oral ingestion of the dosage form after being subjected to in vitro manipulation. 10. The dosage form according to claim 2, wherein the demonstrated resistance to the in vitro manipulation includes releasing less than 69% by weight of the hydrocodone or salt thereof during a period of up to 30 minutes following oral ingestion of the dosage form after being subjected to in vitro manipulation. 11. The dosage form according to claim 2, wherein the demonstrated resistance to the in vitro manipulation includes releasing less than 70% by weight of the hydrocodone or salt thereof during a period of 120 minutes following oral ingestion of the dosage form after being subjected to in vitro manipulation. 12. The dosage form according to claim 2, wherein the demonstrated resistance to the in vitro manipulation includes releasing less than 82% by weight of the hydrocodone or salt thereof during a period of 120 minutes following oral ingestion of the dosage form after being subjected to in vitro manipulation. 13. The dosage form according to claim 2, wherein the demonstrated resistance to the in vitro manipulation includes releasing less than 15% by weight of the hydrocodone or salt thereof following intranasal insufflation of the dosage form after being subjected to in vitro manipulation for a period of up to 10 minutes, the in vitro manipulation being sufficient to render the dosage form into a powder. 14. The dosage form according to claim 2, wherein the demonstrated resistance to the in vitro manipulation includes releasing less than 40% by weight of the hydrocodone or salt thereof following intranasal insufflation of the dosage form after being subjected to in vitro manipulation for a period of up to 10 minutes, the in vitro manipulation being sufficient to render the dosage form into a powder. 15. The dosage form according to claim 2, wherein the demonstrated resistance to the in vitro manipulation includes releasing less than 20% by weight of the hydrocodone or salt thereof following intranasal insufflation of the dosage form after being subjected to in vitro manipulation for a period of up to 30 minutes, the in vitro manipulation being sufficient to render the dosage form into a powder. 16. The dosage form according to claim 2, wherein the demonstrated resistance to the in vitro manipulation includes releasing less than 47% by weight of the hydrocodone or salt thereof following intranasal insufflation of the dosage form after being subjected to in vitro manipulation for a period of up to 30 minutes, the in vitro manipulation being sufficient to render the dosage form into a powder. 17. The dosage form according to claim 2, wherein the demonstrated resistance to the in vitro manipulation includes releasing less than 21% by weight of the hydrocodone or salt thereof following intravenous injection of the dosage form after being subjected to in vitro manipulation followed by combination with an extraction medium for a period of up to 1 minute. 18. The dosage form according to claim 2, wherein the demonstrated resistance to the in vitro manipulation includes releasing less than 50% by weight of the hydrocodone or salt thereof following intravenous injection of the dosage form after being subjected to in vitro manipulation followed by combination with an extraction medium for a period of up to 1 minute. 19. The dosage form according to claim 2, wherein the demonstrated resistance to the in vitro manipulation includes releasing less than 25% by weight of the hydrocodone or salt thereof following intravenous injection of the dosage form after being subjected to in vitro manipulation followed by combination with an extraction medium for a period of up to 5 minutes. 20. The dosage form according to claim 2, wherein the demonstrated resistance to the in vitro manipulation includes releasing less than 35% by weight of the hydrocodone or salt thereof following intravenous injection of the dosage form after being subjected to in vitro manipulation followed by combination with an extraction medium for a period of up to 5 minutes. 21. The dosage form according to claim 2, wherein the chemical extraction includes combining the dosage form with a solvent. 22. The dosage form according to claim 2, wherein the chemical extraction includes subjecting the dosage form to milling, cutting, grinding, crushing, or any combination thereof, followed by combining the material resulting therefrom with a solvent. 23. The dosage form according to claim 22, wherein the chemical extraction further comprises subjecting the combination of the solvent and the material to agitation. 24. The dosage form according to any one of claims 21 to 23, wherein the solvent is an aqueous solution having a pH of 2 to 8, an aqueous alcohol solution, or any combination thereof. 25. The dosage form according to claim 24, wherein the demonstrated resistance to the in vitro manipulation includes releasing less than 10% by weight of the hydrocodone or salt thereof after being subjected to in vitro manipulation, combined with the solvent for a period of up to 30 minutes, and optionally being subjected to agitation during this period. 26. The dosage form according to claim 24, wherein the demonstrated resistance to the in vitro manipulation includes releasing less than 40% by weight of the hydrocodone or salt thereof after being subjected to in vitro manipulation, combined with the solvent for a period of up to 120 minutes, and optionally being subjected to agitation during this period. 27. The dosage form according to any one of claims 21 to 23, wherein the chemical extraction further comprises isolation of a residue resulting from the combination, the residue containing the hydrocodone or salt thereof. 28. The dosage form according to claim 27, wherein the solvent comprises one or more organic solvents. 29. The dosage form according to any one of claims 21 to 23, wherein the chemical extraction further comprises a multiple step liquid-liquid extraction. 30. The dosage form according to claim 29, wherein the solvents used in the liquid-liquid extraction comprise one or more organic solvents. the matrix comprises hydroxypropylmethyl cellulose in an amount of about 5-12% by weight of the dosage form, and lactose in an amount of about 40-75% by weight of the dosage form. the matrix comprises hydroxypropylmethyl cellulose in an amount of about 8-10% by weight of the dosage form, and lactose in an amount of about 41-73% by weight of the dosage form. 34. The dosage form according to any of claims 1 to 5, wherein the weight of the granule in said dosage form is in a ratio of about 60:40 relative to the coating. 35. A method of treating chronic pain, comprising administering to a subject in need thereof a dosage form according to any of claims 1 to 5. 36. The method according to claim 35, wherein said pain is abdominal pain, pain from arachnoiditis, pain from osteo- or rheumatoid arthritis, back pain, pain from chronic fatigue syndrome, pain from complex regional pain syndrome, pain from conversion disorder, pain from degenerative disc disease, facial pain, pain from fibromyalgia, foot or leg pain, headache pain, hip pain, pain from irritable bowel syndrome, knee pain, neck pain, nerve pain, pain from postherpetic neuralgia, pain from trigeminal neuralgia, pain from diabetic neuropathy, pain from peripheral neuropathy, phantom limb pain, pain from piriformis syndrome, post-surgical pain, pain from reflex sympathetic dystrophy, pain from sciatica, shoulder pain, or pain from temporomandibular joint disorder. 37. The dosage form according to claim 3, wherein the demonstrated pharmacokinetic resistance to the in vitro manipulation includes producing a Cmax following oral ingestion of the dosage form after being subjected to in vitro manipulation that is no more than about 75% greater than the Cmax for the dosage form when it is not subjected to the in vitro manipulation. 38. The dosage form according to claim 3 or claim 37, wherein the demonstrated pharmacokinetic resistance to the in vitro manipulation includes producing a tmax following oral ingestion of the dosage form after being subjected to in vitro manipulation that occurs in no sooner than about 36% of the time for the dosage form when it is not subjected to the in vitro manipulation. 39. The dosage form according to claim 3 or claim 37, wherein the demonstrated pharmacokinetic resistance to the in vitro manipulation includes producing a AUCo-∞ following oral ingestion of the dosage form after being subjected to in vitro manipulation that is no more than about 10% greater than the AUCo-∞ for the dosage form when it is not subjected to the in vitro manipulation. 40. The dosage form according to claim3 or claim 37, wherein the dosage form contains 45 mg of hydrocodone or a salt thereof, and the demonstrated pharmacokinetic resistance to the in vitro manipulation includes producing a Cmax following oral ingestion of the dosage form after being subjected to in vitro manipulation that is no more than about 42% greater than the Cmax for the dosage form when it is not subjected to the in vitro manipulation. 41. The dosage form according to claim 3 or claim 37, wherein the demonstrated pharmacokinetic resistance to the in vitro manipulation includes producing a tmax following oral ingestion of the dosage form after being subjected to in vitro manipulation that occurs in no sooner than about 60% of the time for the dosage form when it is not subjected to the in vitro manipulation. 42. The dosage form according to claim 3 or claim 37, wherein the demonstrated pharmacokinetic resistance to the in vitro manipulation includes producing a AUCo-∞ following oral ingestion of the dosage form after being subjected to in vitro manipulation that is no more than about 1% greater than the AUCo-∞ for the dosage form when it is not subjected to the in vitro manipulation. 43. The dosage form according to claim 3 or claim 37, wherein the demonstrated pharmacokinetic resistance to the in vitro manipulation includes producing a Cmax following intranasal insufflation of the dosage form after being subjected to in vitro manipulation that is no more than about 230% greater than the Cmax for the dosage form when it is not subjected to the in vitro manipulation and when it is orally ingested. 44. The dosage form according to claim 3 or claim 37, wherein the demonstrated pharmacokinetic resistance to the in vitro manipulation includes producing a Cmax following intranasal insufflation of the dosage form after being subjected to in vitro manipulation that is no more than about 85% of the Cmax for intranasally insufflated hydrocodone bitartrate API. 45. The dosage form according to claim 3 or claim 37, wherein the demonstrated pharmacokinetic resistance to the in vitro manipulation includes producing a tmax following intranasal insufflation of the dosage form after being subjected to in vitro manipulation that occurs in no sooner than about 25% of the time for the dosage form when it is not subjected to the in vitro manipulation and when it is orally ingested. 46. The dosage form according to claim 3 or claim 37, wherein the demonstrated pharmacokinetic resistance to the in vitro manipulation includes producing a tmax following intranasal insufflation of the dosage form after being subjected to in vitro manipulation that occurs in at least 190% of the time corresponding to the tmax for intranasally insufflated hydrocodone bitartrate API. 47. The dosage form according to claim 3 or claim 37, wherein the demonstrated pharmacodynamic resistance to the in vitro manipulation includes producing an overall drug liking effect score following oral ingestion of the dosage form after being subjected to in vitro manipulation that is no more than about 20% greater than the overall drug liking effect score for the dosage form when it is not subjected to the in vitro manipulation and when it is orally ingested. pharmacodynamic resistance to the in vitro manipulation includes producing a maximum drug liking effect score following oral ingestion of the dosage form after being subjected to in vitro manipulation that is no more than about 25% greater than the maximum drug liking effect score for the dosage form when it is not subjected to the in vitro manipulation and when it is orally ingested. pharmacodynamic resistance to the in vitro manipulation includes producing an overall drug liking effect score following intranasal insufflation of the dosage form after being subjected to in vitro manipulation that is no more than about 20% greater than the overall drug liking effect score for the dosage form when it is not subjected to the in vitro manipulation and when it is orally ingested. pharmacokinetic resistance to the in vitro manipulation includes producing a maximum drug liking effect score following intranasal insufflation of the dosage form after being subjected to in vitro manipulation that is no more than about 30% greater than the maximum drug liking effect score for the dosage form when it is not subjected to the in vitro manipulation and when it is orally ingested. 51. The dosage form according to claim 4, wherein the extraction of the hydrocodone or salt thereof comprises combining the manipulated dosage form with a solvent, and subsequently removing the solvent in order to produce a residue containing the hydrocodone or salt thereof. 52. The dosage form according to claim 51, wherein the solvent is an aqueous solvent, an organic solvent, or any combination thereof. 53. The dosage form according to claim 51, wherein the extraction of the hydrocodone or salt thereof further comprises agitating the combination of the manipulated dosage form with a solvent. 54. The dosage form according to any one of claims 4, 51, 52, or 53, wherein the purity of the extracted hydrocodone or salt thereof is less than 20% by weight following in vitro manipulation of the dosage form, combination of the results of the manipulation with a solvent, agitating the combination for a period of up to 30 minutes, and removing the solvent in order to produce the extracted hydrocodone or salt thereof. 55. The dosage form according to any one of claims 4, 51, or 52, wherein the purity of the extracted hydrocodone or salt thereof is less than 15% by weight following in vitro manipulation of the dosage form, combination of the results of the manipulation with a solvent, agitating the combination for a period of up to 30 minutes, and removing the solvent in order to produce the extracted hydrocodone or salt thereof. 56. The dosage form according to claim 4, wherein the extraction of the hydrocodone or salt thereof comprises a multiple step liquid-liquid extraction of the hydrocodone or salt thereof from the manipulated dosage form. 57. The dosage form according to claim 56, wherein the solvents used in the liquid-liquid extraction comprise one or more organic solvents. 58. The dosage form according to claim 56 or claim 57, wherein the purity of the extracted hydrocodone or salt thereof is less than 50% by weight following in vitro manipulation of the dosage form, subjecting the results of the manipulation to a multiple step liquid-liquid extraction procedure, and removing the solvent from the extraction procedure to produce the extracted hydrocodone or salt thereof. 59. The dosage form according to claim 56 or claim57, wherein the purity of the extracted hydrocodone or salt thereof is less than 40% by weight following in vitro manipulation of the dosage form, subjecting the results of the manipulation to a multiple step liquid-liquid extraction procedure, and removing the solvent from the extraction procedure to produce the extracted hydrocodone or salt thereof. 60. The dosage form according to claim 5, wherein the demonstrated resistance comprises one or more pharmacokinetic parameters when ingested with alcohol that are bioequivalent to pharmacokinetic parameters that result from ingestion of the dosage form in the absence of alcohol. 61. The dosage form according to claim 5 or claim 60, wherein said alcohol has an ethanol content of up to 4% by volume. 62. The dosage form according to claim 5 or claim 60, wherein said alcohol has an ethanol content of up to 20% by volume. 63. The dosage form according to claim 5 or claim 60, wherein said alcohol has an ethanol content of up to 40% by volume. 64. The dosage form according to claim 63, wherein the dosage form produces a Cmax when orally ingested with alcohol that is no more than 10% greater than the Cmax for the dosage form when it is not ingested with alcohol. 65. The dosage form according to claim 63, wherein the dosage form produces a tmax when orally ingested with alcohol that occurs in no sooner than about 75% of the time for the dosage form when it is not subjected to the in vitro manipulation. 66. The dosage form according to claim 63, wherein the dosage form produces a tmax when orally ingested with alcohol that occurs no sooner than the tmax for the dosage form when it is not subjected to the in vitro manipulation. 67. The dosage form according to claim 63, wherein the dosage form produces a AUCo-∞ when orally ingested with alcohol that is no more than about 15% greater than the AUCo-∞ for the dosage form when it is not ingested with alcohol. 68. The dosage form according to claim 63, wherein the dosage form produces a AUCo-∞ when orally ingested with alcohol that is no more than about 10% greater than the AUCo-∞ for the dosage form when it is not ingested with alcohol.